It’s Friday friends, and we are so excited to revisit a fun feature that we haven’t shared on our blog for quite a while–I Spy We R! 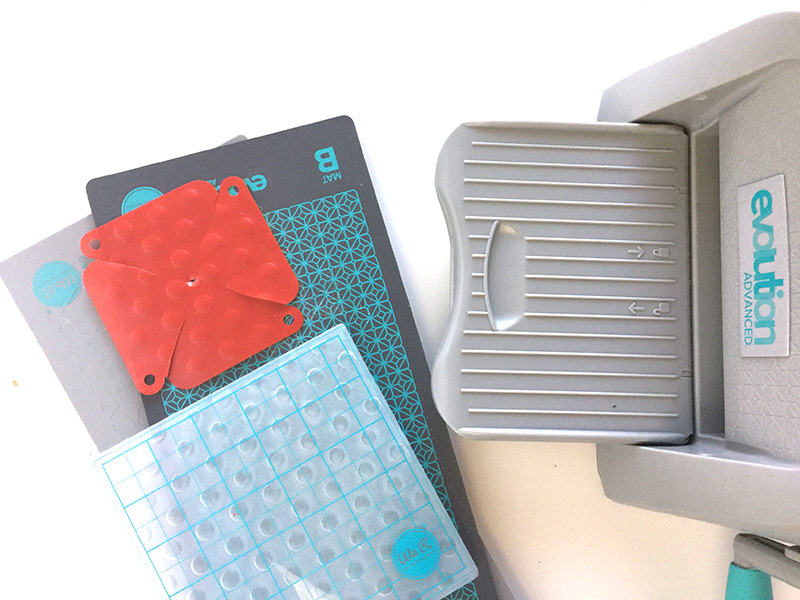 For this blog feature we scour the internet looking for projects from our fans that use We R tools, and then we share them in an I Spy roundup. Today the I Spy feature has a theme, and that is Patriotic Projects. We found ten really fabulous red, white, and blue inspirational projects on the internet to share with you today, so sit back, relax, and enjoy! 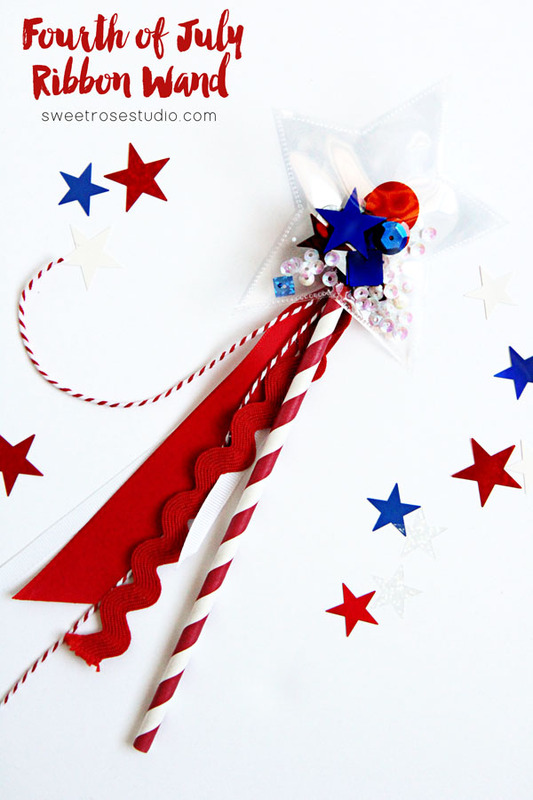 Use your Photo Sleeve Fuse to create a festive shaker ribbon wand for Independence Day. How perfect would this be for your local parade? 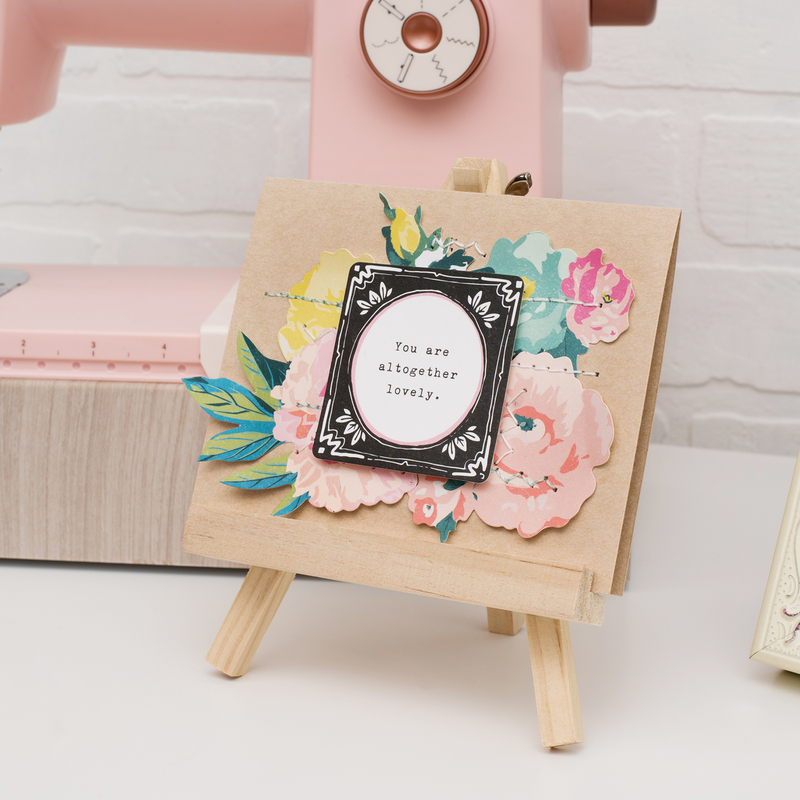 Check out the Sweet Rose Studio blog HERE for full instructions. 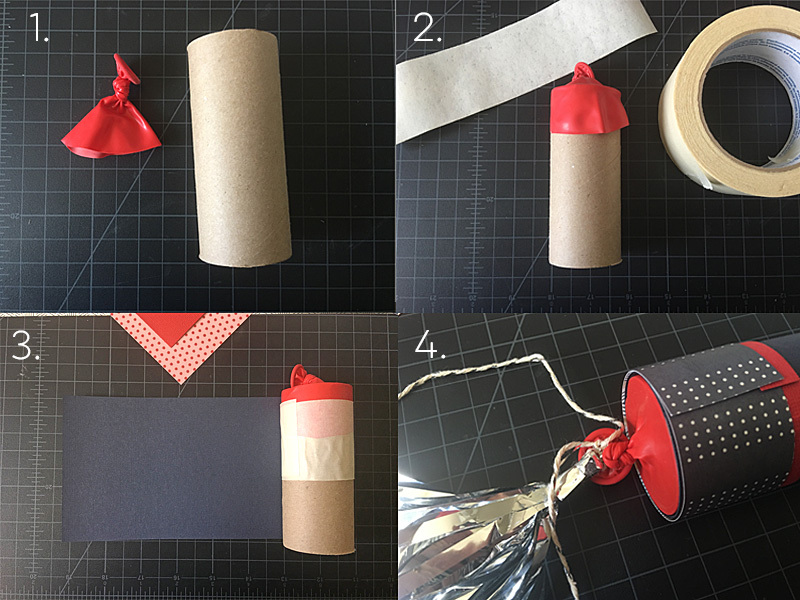 Grab your Banner Punch Board and your favorite patriotic papers, and make a red, white, and blue banner to celebrate the great US of A! 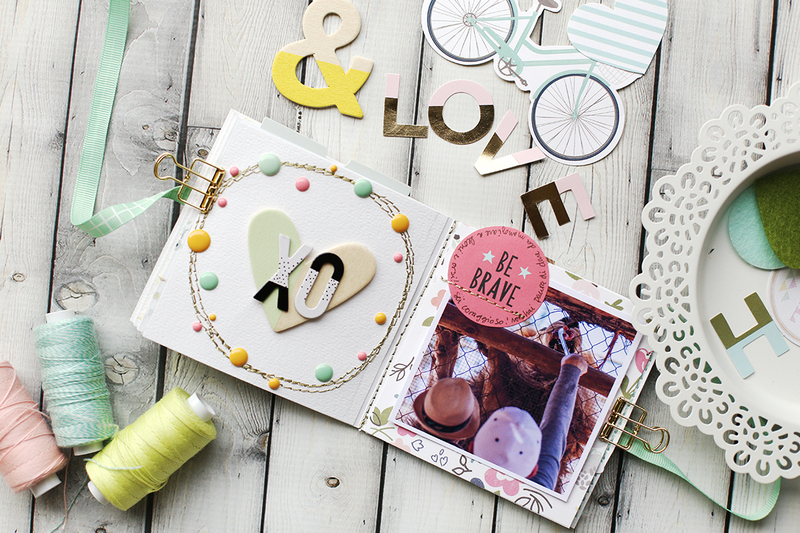 Laura from Laura’s Crafty Life shares the how-to HERE. 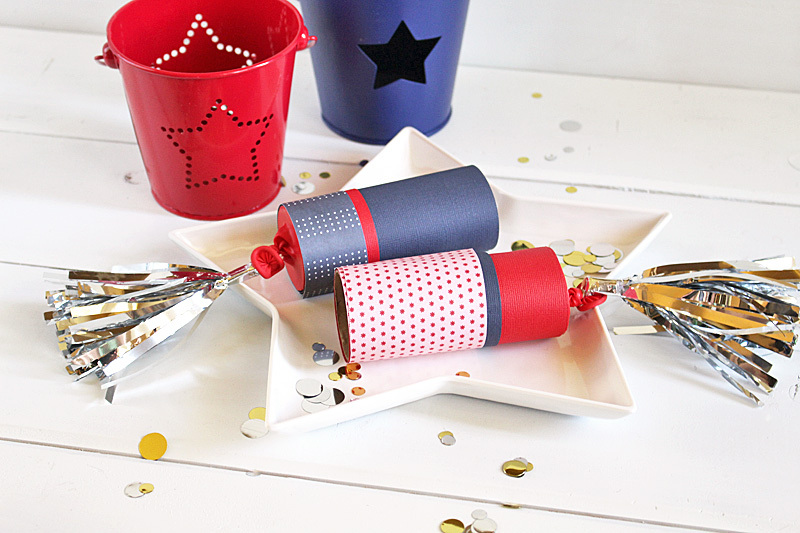 Here’s another take on a patriotic banner by Eva Pizarro for Pebbles Inc. CLICK HERE to learn how she made this festive piece of patriotic decor with the Banner Punch Board. 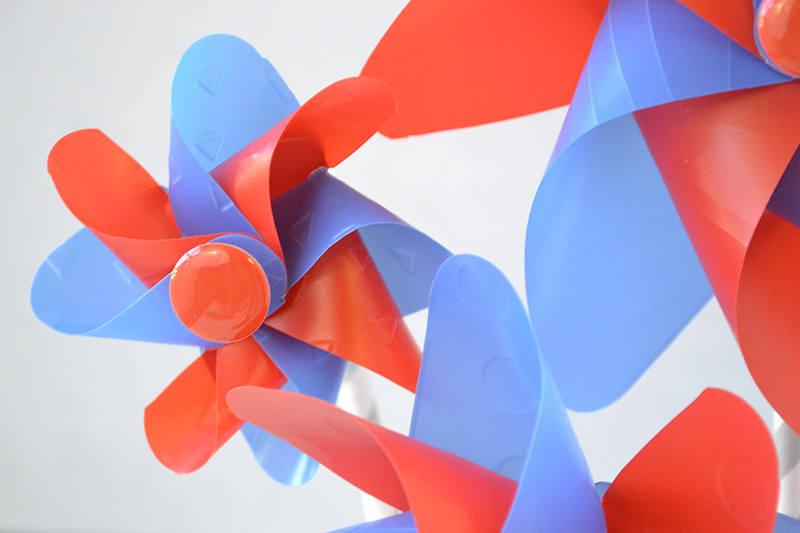 Our friends at Blitsy made these beautiful Paper Rosettes with the DIY Party Rosette Punch. 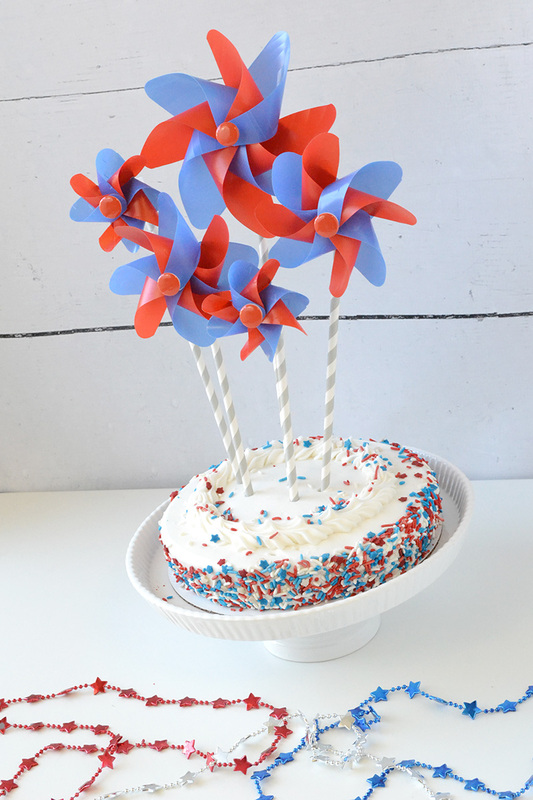 Visit the Blitsy website HERE for instructions on how to make these rosettes for your patriotic party next weekend. 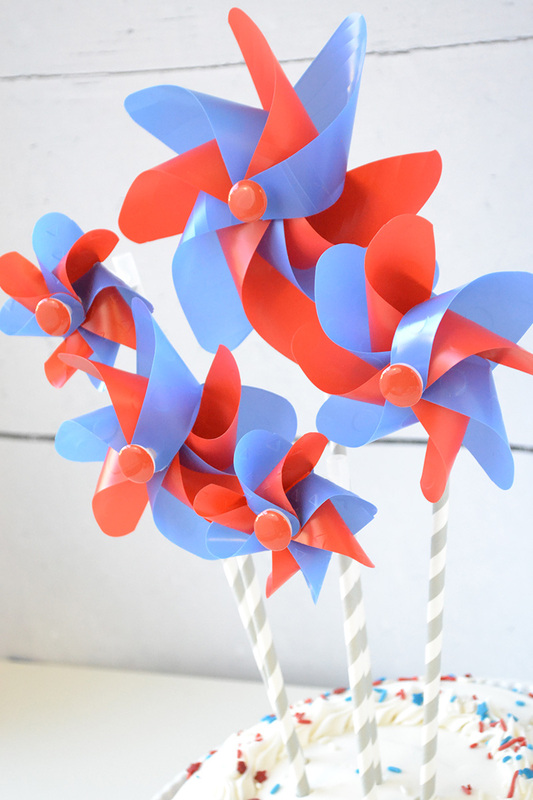 Nothing says summer like pinwheels, and they’re the perfect decor for your July Fourth event! 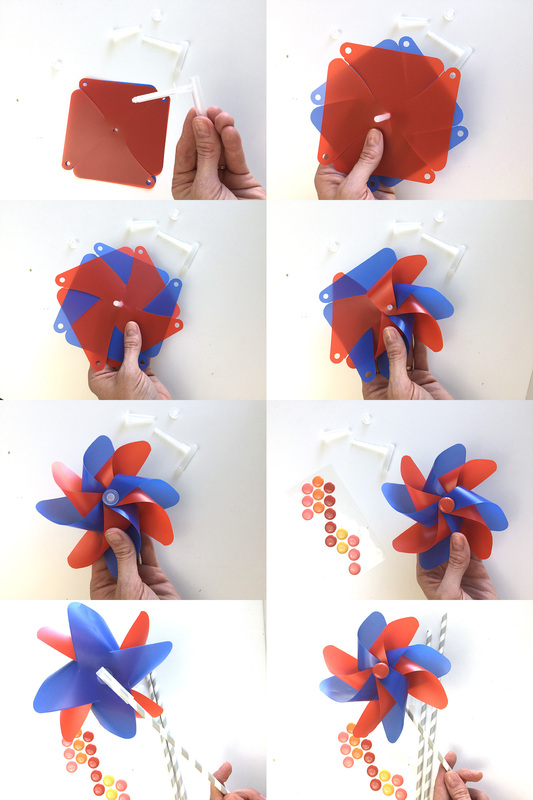 CLICK HERE to visit the Pebbles, Inc blog for instructions from Amanda Coleman on how to make your own with the Pinwheel Punch Board. 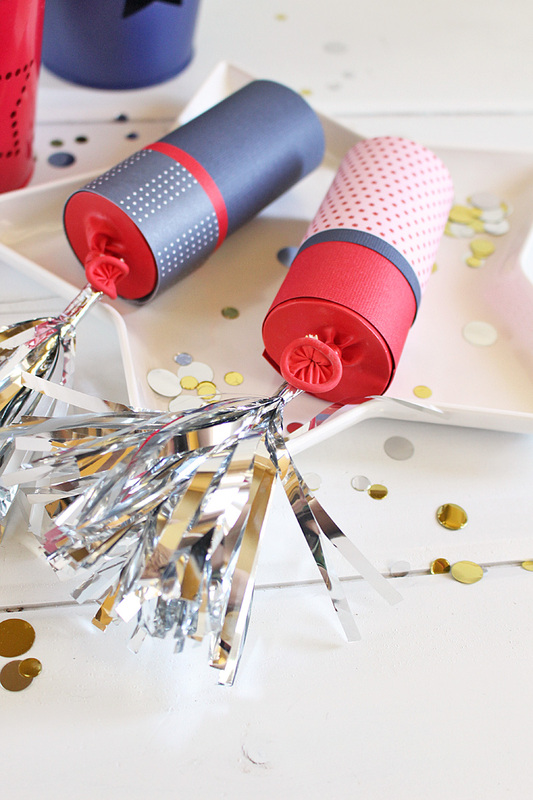 Make a trendy garland, perfect for any patriotic party, with the Alphabet Punch Board, the Link Punch, and your favorite red, white, and blue paper. Visit the Crafty Blog Stalker HERE for more photos and details. 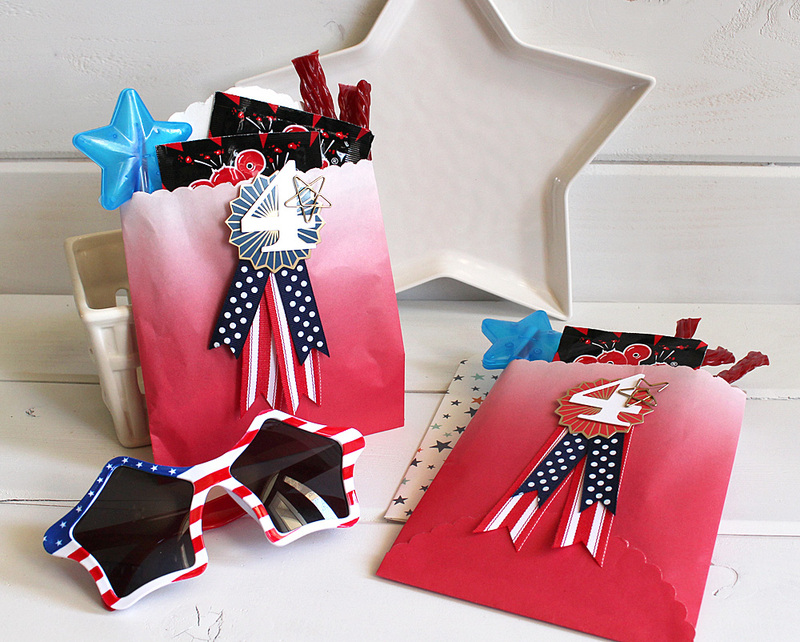 If you need ideas for a patriotic favor or hostess gift, look no further than THESE darling red, white, and blue gift bags by Wendy Sue Anderson that we found on the Pebbles, Inc blog. 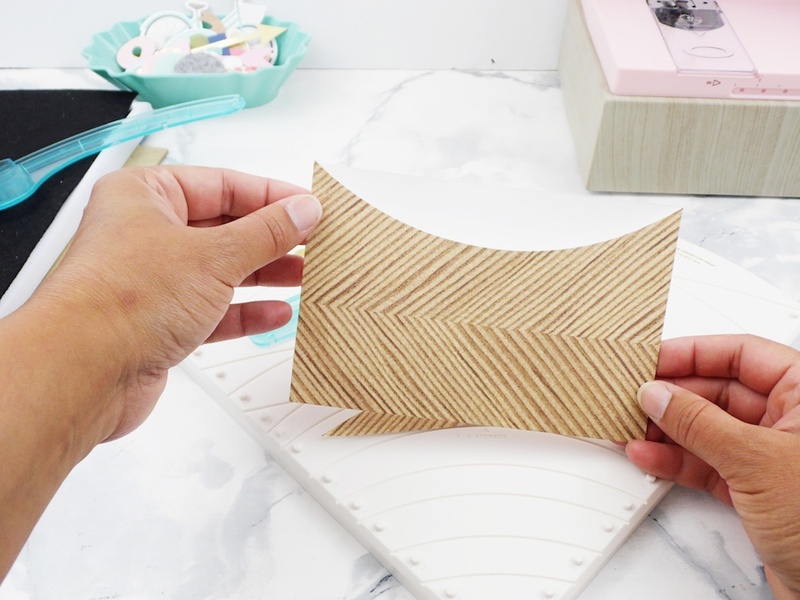 They’re easy to make with the Gift Bag Punch Board! 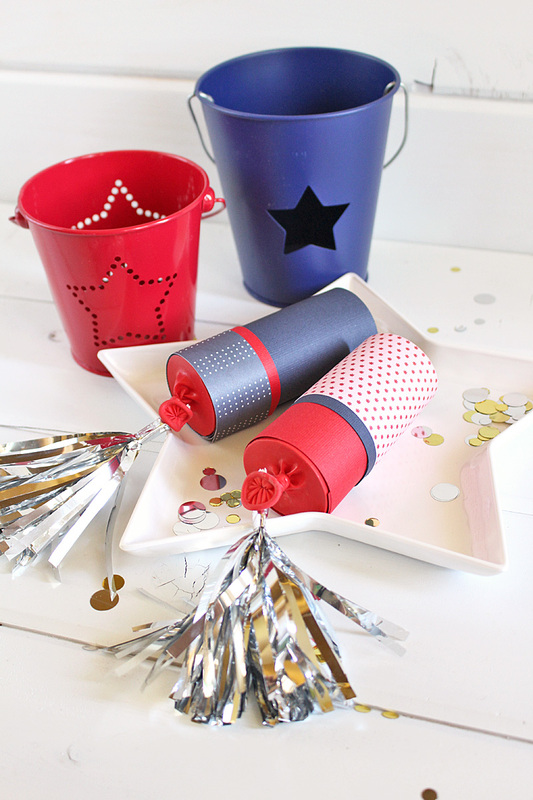 Assemble these easy treat cups for a summer backyard barbecue with the Crop-A-Dile and some patriotic ribbon. Light up the outdoor fireplace and these are the perfect pre-firework dessert! CLICK HERE for full instructions from Just Destiny Mag. The Crop-A-Dile can punch through more than just a paper cup! 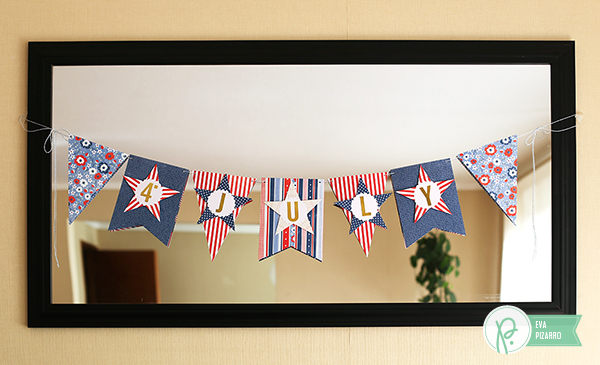 Save those old pairs of jeans, cut out the pockets, and make this cute all-american banner for your Independence Day celebration. Punch holes in the corners of the denim pockets with your Crop-A-Dile, add eyelets, and tie them together to make a perfect patriotic garland. 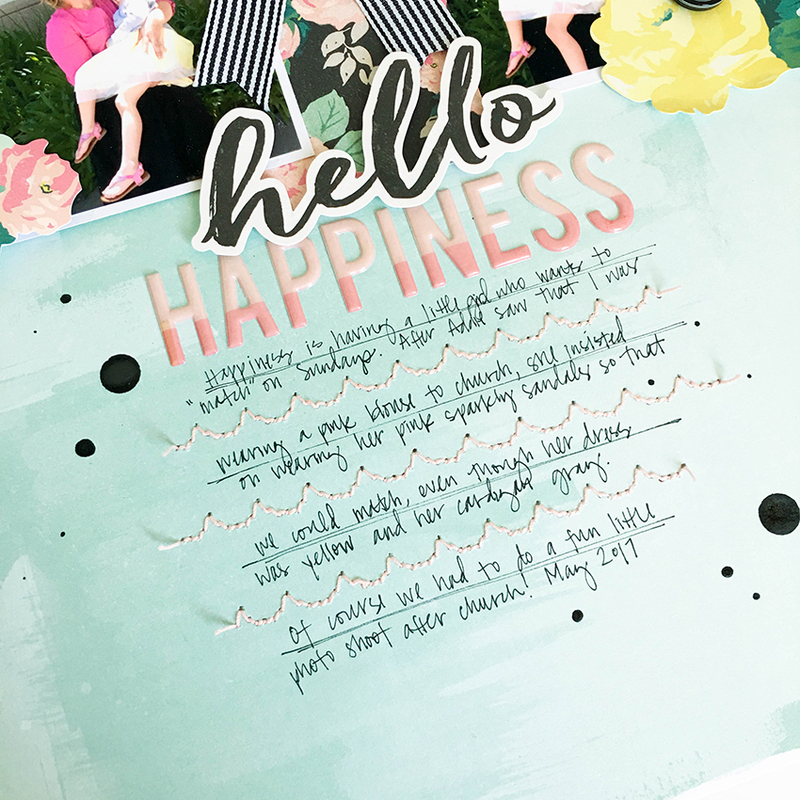 CLICK HERE for full instructions on the Pen + Paper Flowers blog. 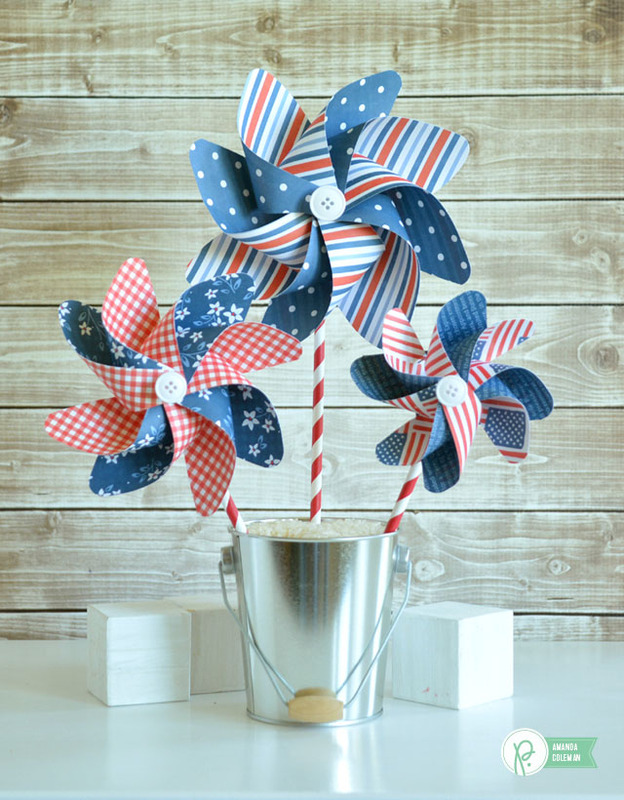 Our final project is another perfect hostess gift or party favor idea from Eva Pizarro for Pebbles Inc. Visit their blog HERE to learn how she made these adorable patriotic gift boxes topped with pretty pinwheels using the 123 Punch Board, the Pinwheel Punch Board, and the Crop-A-Dile. Thanks for joining us today! 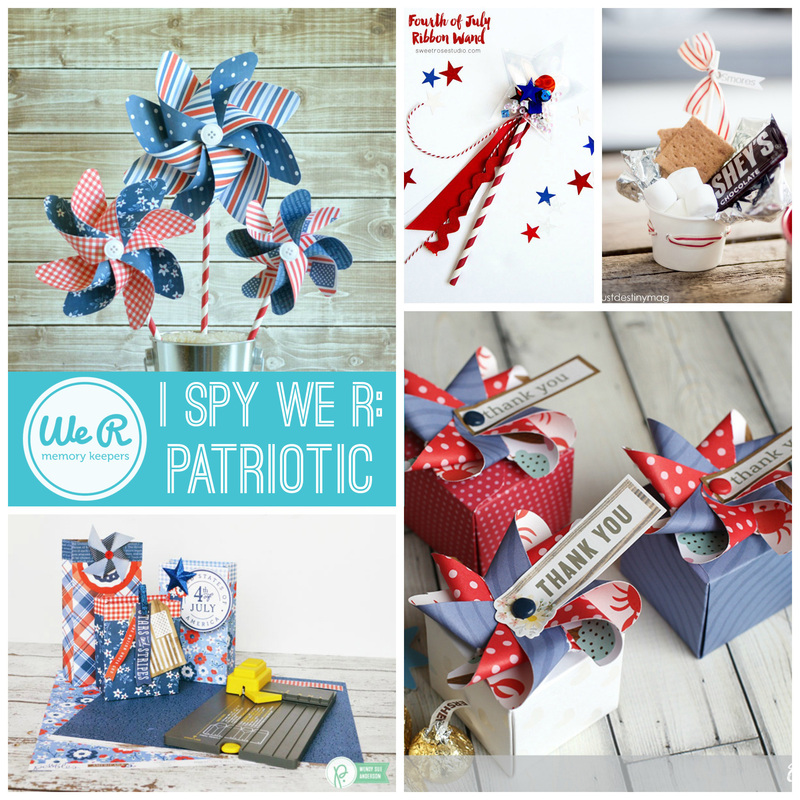 We hope this patriotic version of I Spy We R has inspired your Independence Day crafting. Have a fun and safe weekend, friends, and we’ll see you back here next week! Welcome to Throwback Thursday friends! 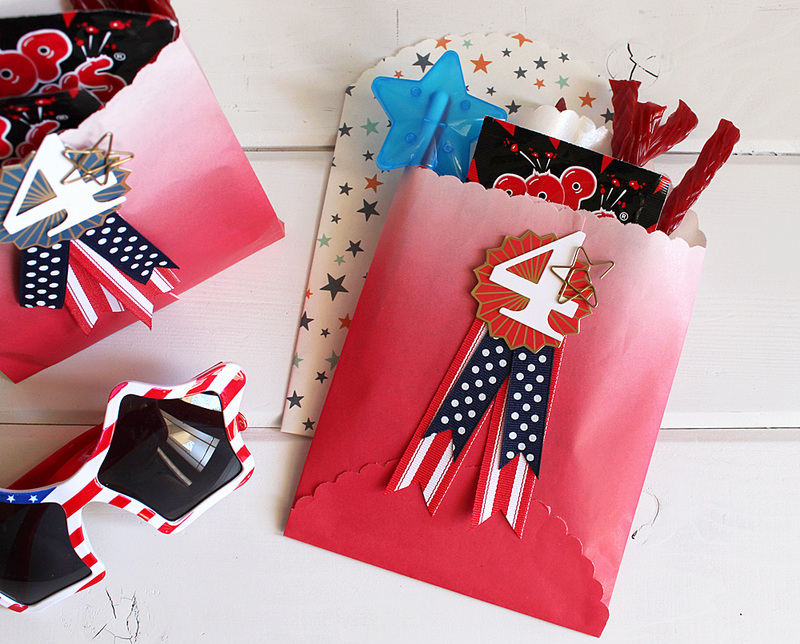 Today we’re throwing it back to last summer with a popular patriotic kids activity that’s perfect for Independence Day parties and other patriotic events. It will keep the kids entertained and having fun for hours! 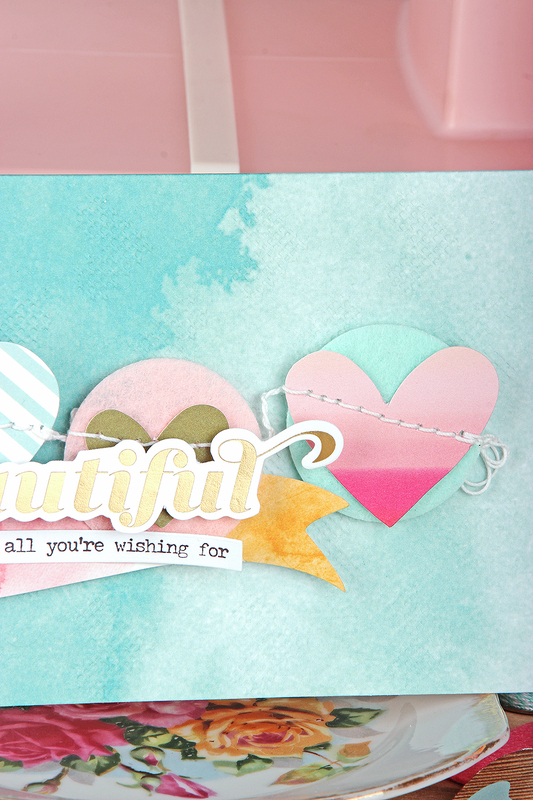 Check out the full tutorial from Kimberly Crawford below. Hello We R Fans! 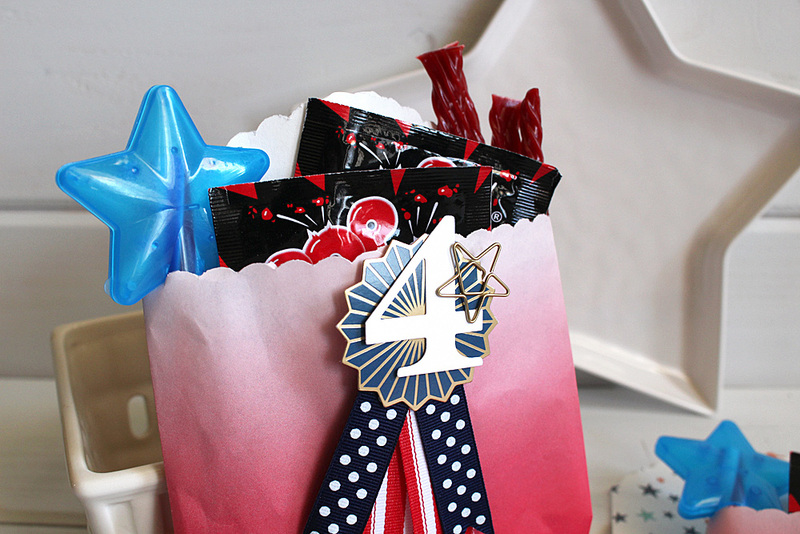 Kimberly here with a fun and quick treat bag for your Fourth of July celebrations! Each year on the Fourth, everyone spends the day, following the parade, at my parent’s house on the lake. After the day in the sun, we head back into town early, to get good seats for the fireworks. The littles, and let’s face it, the big people too, get a bit restless waiting for dusk. So, I thought it would be fun to make little treat bags to keep everyone entertained and happy. The We R Memory Keepers Scallop Goodie Bag Guide helped me put these festive packages together easily! With a few seasonal treats and silly accessories, these bags will be a hit! I started by using the Scallop Goodie Bag Guide to cut a few pieces of food-safe glassine papers. 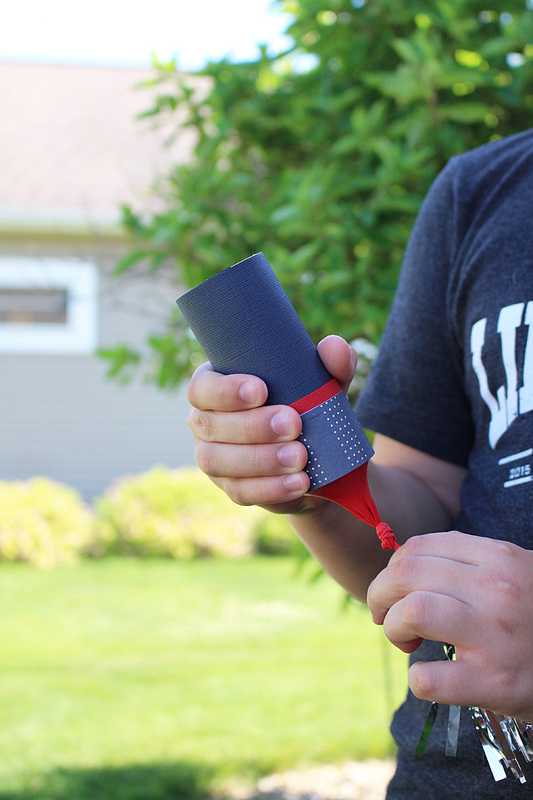 The Guide allows you to tear the paper by simply pulling. It also has a straight-edge for getting crisp folds. 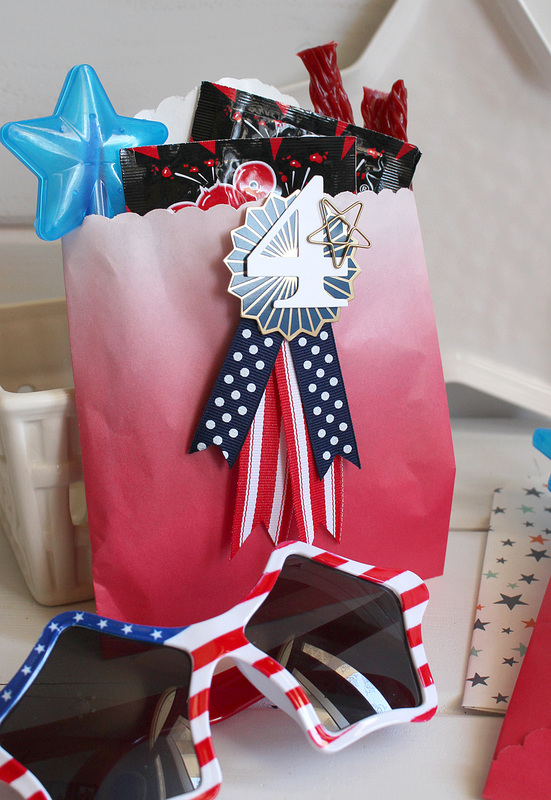 Inside each bag are Pop Rocks candy, licorice, glow bracelets, glow wants, and a pair of ridiculous sunglasses. Lots of fun! I see selfies happening already! 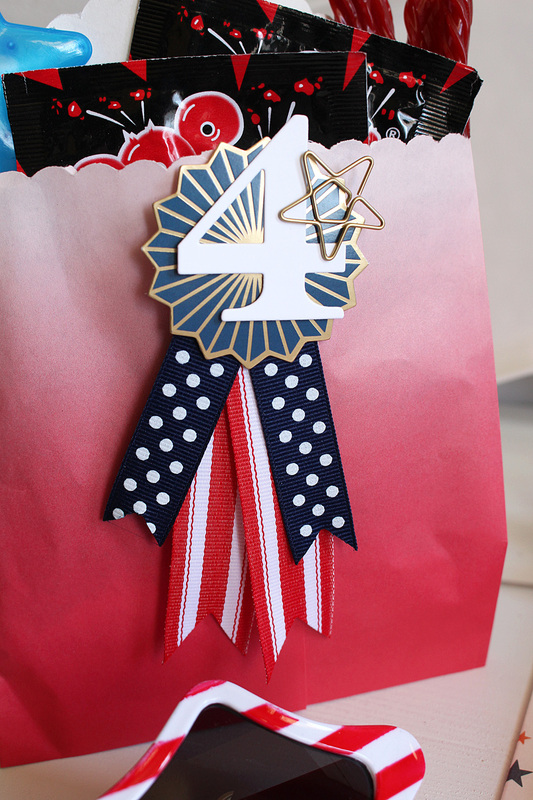 On each bag, I attached a medallion I created with ribbon and a pre-made star burst from the Oh Goodie line. To get clean cut edges on my ribbon, I used the Ribbon Cutter tool. This tool not only cuts the ribbon, but seals it too. To get the notched ends in the ribbon, I folded it in half before placing it in the tool. The sharper the angle it is placed in the tool, the deeper the notch. These cute bags came together quickly. 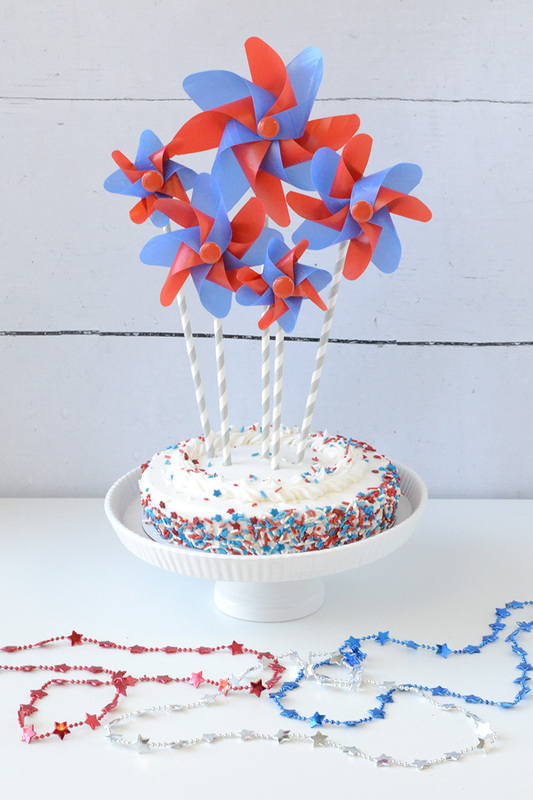 Who needs to make these for their Fourth of July celebration? 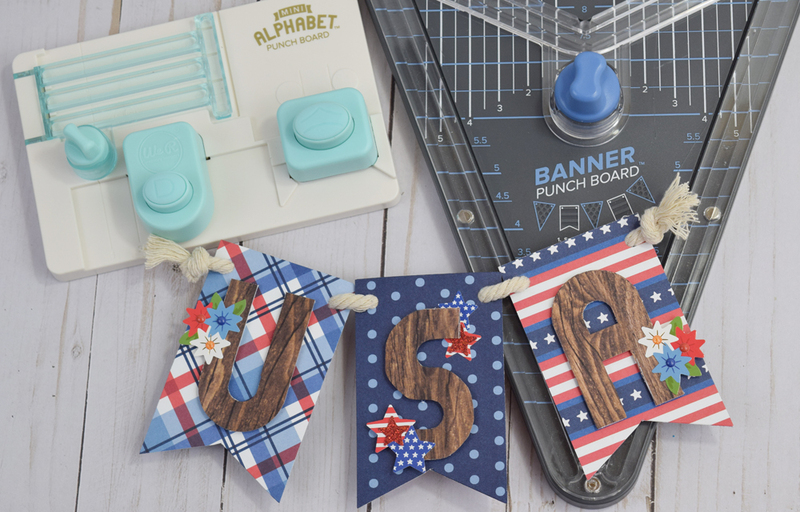 Hey there We R Memory Keeper friends and fans, Becki here, to share a really fun, really easy patriotic banner with the mini alphabet punch board. True confession time, this is the first time I’ve played with the Mini Alphabet Punch Board. I can honestly say that I had so much fun playing with it and that it wasn’t nearly as confusing as I thought it would be. I dug into my stash of patterned papers and embellishments to find some red, white, and blue supplies. I found the “America the Beautiful” collection from Pebbles. Of course, this is the perfect collection for this project. The “USA” letters are the first thing I cut out with the dark wood grain patterned paper. It only takes a few minutes to punch/cut each letter. 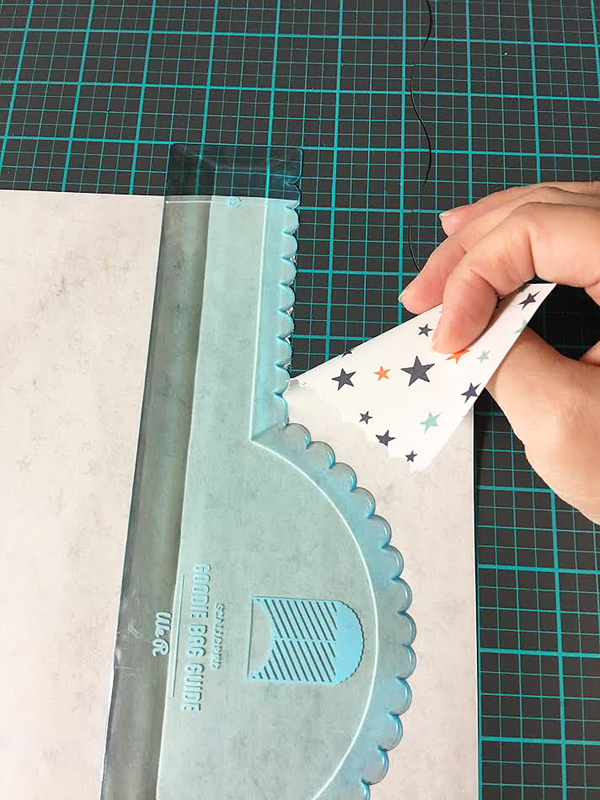 Then, I cut the banner shapes with the Banner Punch Board (one of my favorite tools). 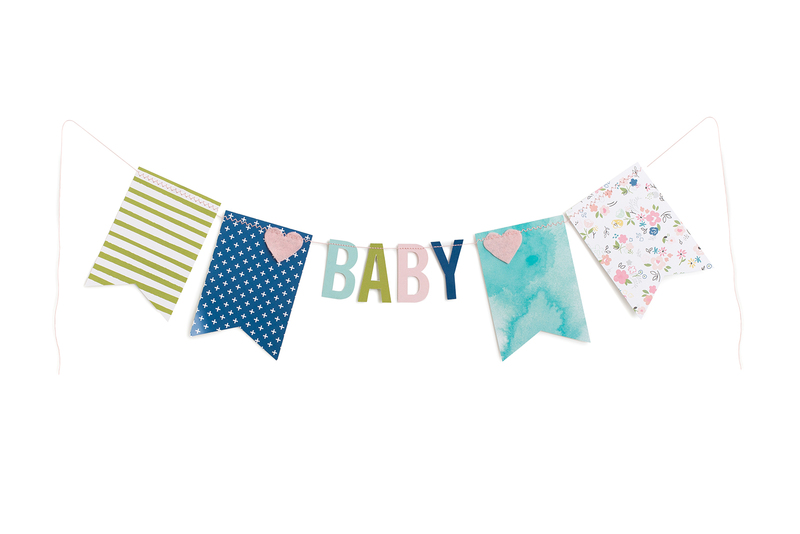 Each banner piece is 2 1/2 x 3 1/2 inches. 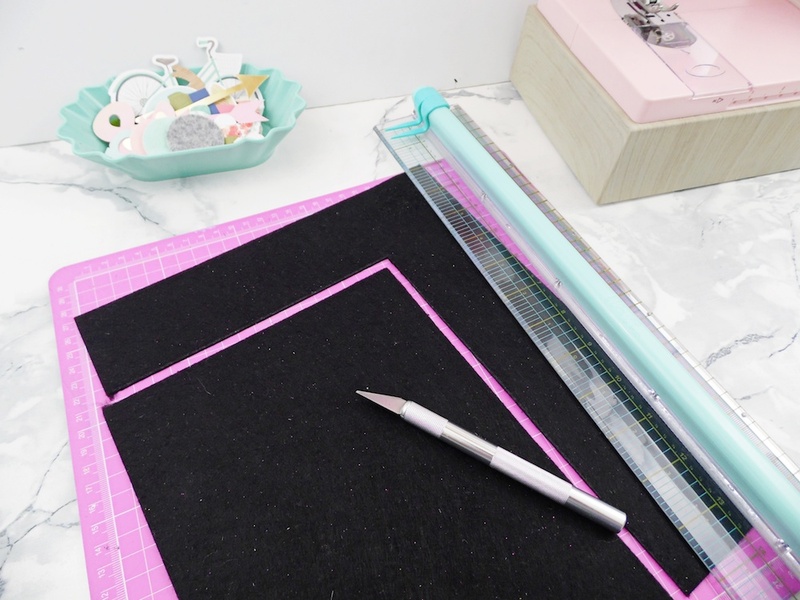 The banner punch board makes cutting out pieces for a banner a breeze! After cutting all the pieces out, I was ready to assemble the banner. I used pop dots to adhere the letters and some of the stickers to the banner pieces. Each banner piece is a little bit different. The banner is put together with a thin piece of rope. The knot at either end of the banner not only keeps the banner pieces from falling off but it adds a fun textural element to the finished banner. 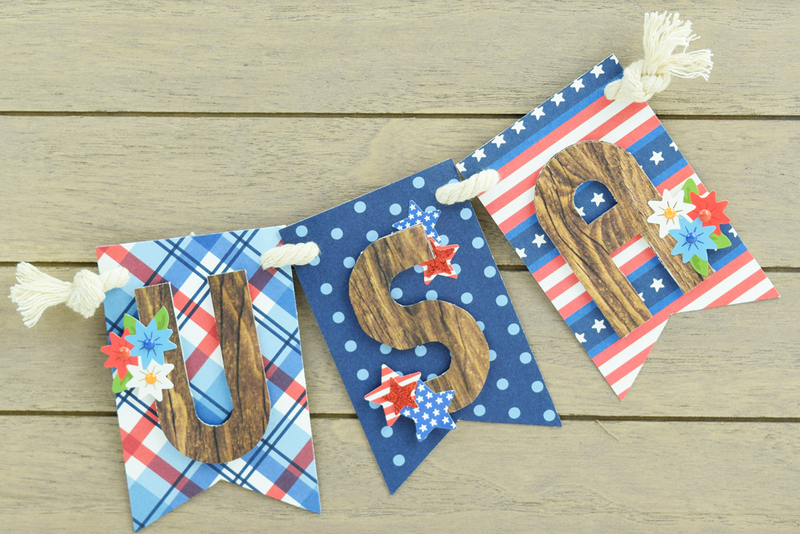 I’d love to hear about what patriotic home decor you’re creating this Summer season. 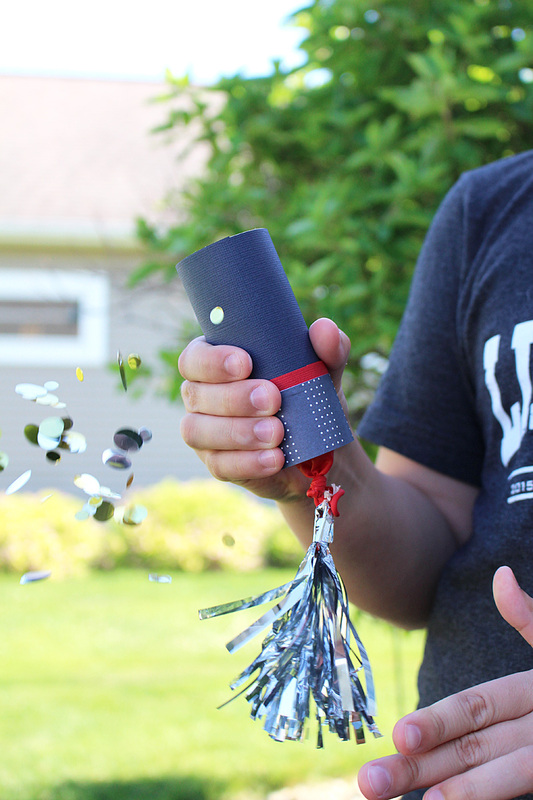 Now, you can create your own patriotic banner with the Mini Alphabet Punch Board. Thank you for stopping by the We R Memory Keepers blog. Have a happy Summer! 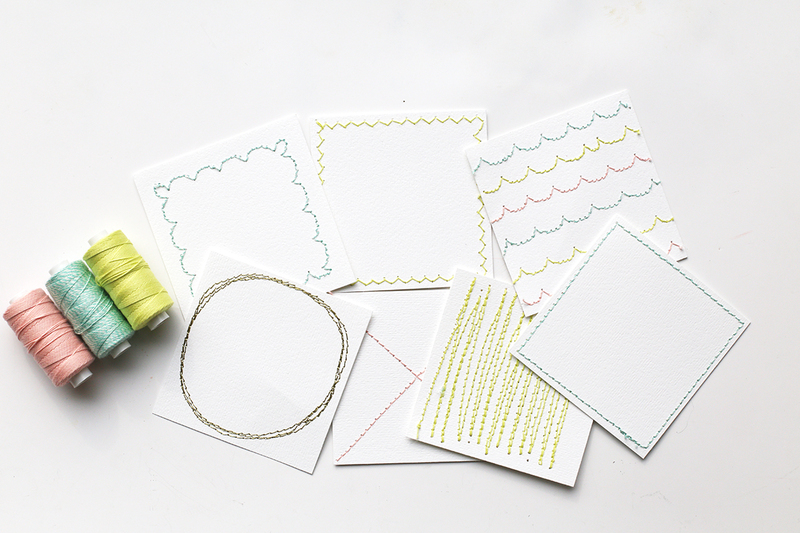 How adorable are these scallop-stitched journaling lines? It’s a simple technique, but great for this novice sewer. 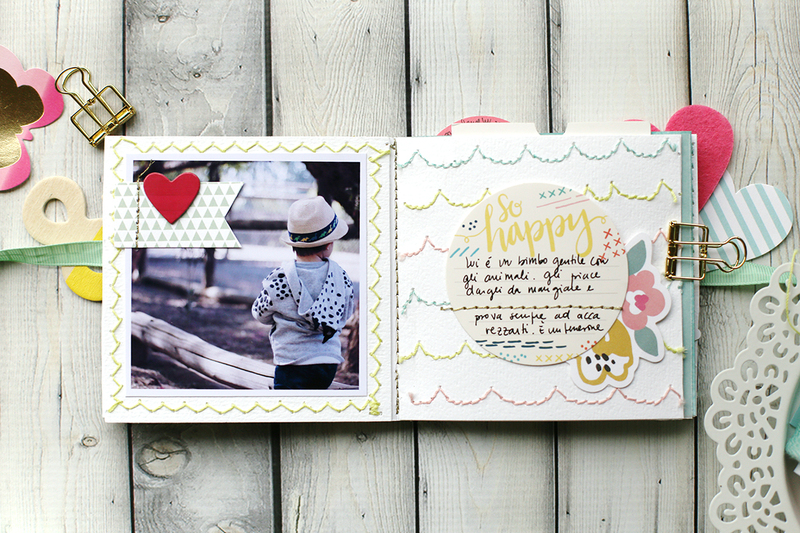 In no time at all I added texture and whimsy to my layout while giving the journaling that special “something”. The machine was oh-so-easy to thread with this lovely Sew Happy pink thread. I love the thickness of the thread, which helped to make my scallops stand out from the background patterned paper. I will share a lesson that I learned since I can’t possibly be the only beginner out there, right? I wanted the scallops to face the way that you see here, but I assembled the rest of my page before sewing. That means that the top of my layout, with all those layers, needed to flex under the arm of the machine in order for my stitching to go where I wanted it. Had my layers been more stiff, it could have been a problem, but I lucked out. Next time, if I’m being picky about the orientation of the scallops, I’ll stitch first and assemble later. I’m feeling pretty good about my first attempt at machine stitching on a layout, and it’s all thanks to the Stitch Happy! As beginner friendly as this machine is, I don’t think I’ll get bored of using it as my skills increase. I can’t wait to learn more! Hello and welcome, Chantalle with you today! 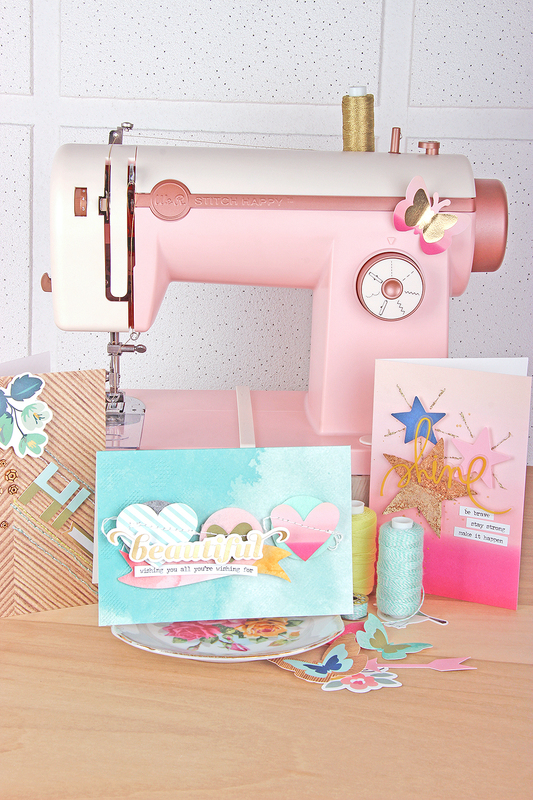 I’d love to share some cards I have created with the help of my amazing new Stitch Happy Sewing Machine. Gone are my days of adding stitching detail by hand to get a bolder effect. Being able to sew with multimedia threads like baker’s twine is a serious game changer! 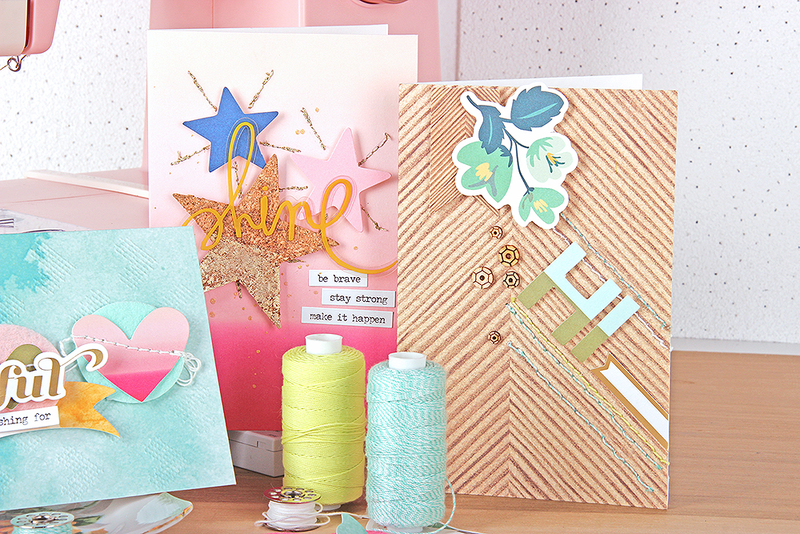 I’ve used the Stitch Happy Card Kit, and added stitching to create different effects on these three cards. 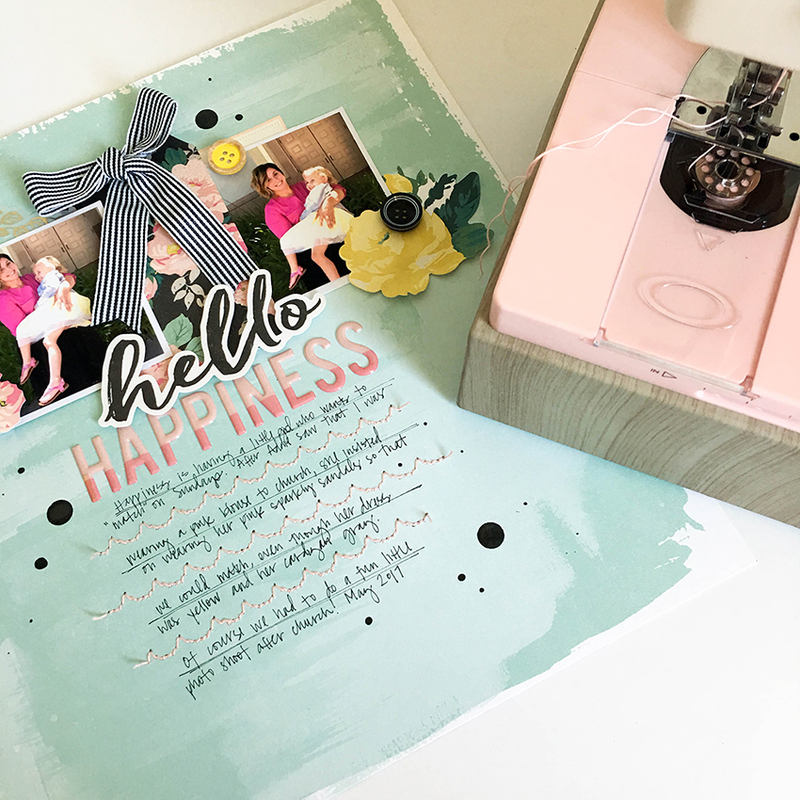 The kit contains 61 pieces in all… Ten cards with envelopes and 35 pieces of ephemera – Plenty to create gorgeous layered cards! I love adding stitching to my projects as it just adds that touch of texture and detail. You can imagine my excitement when I saw that the multimedia threads came in metallic options – AH-MAZING! 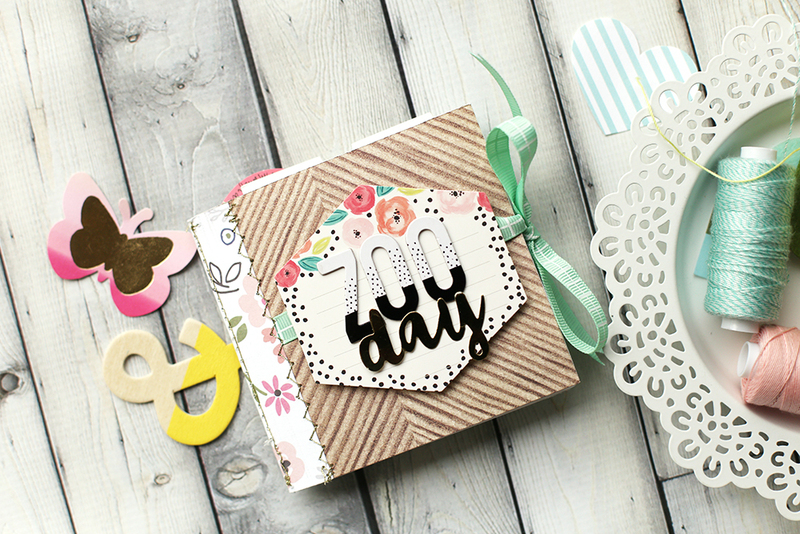 This birthday card has a sweet mini banner as an embellishment across the front. The white multimedia thread really pops against the pink background! 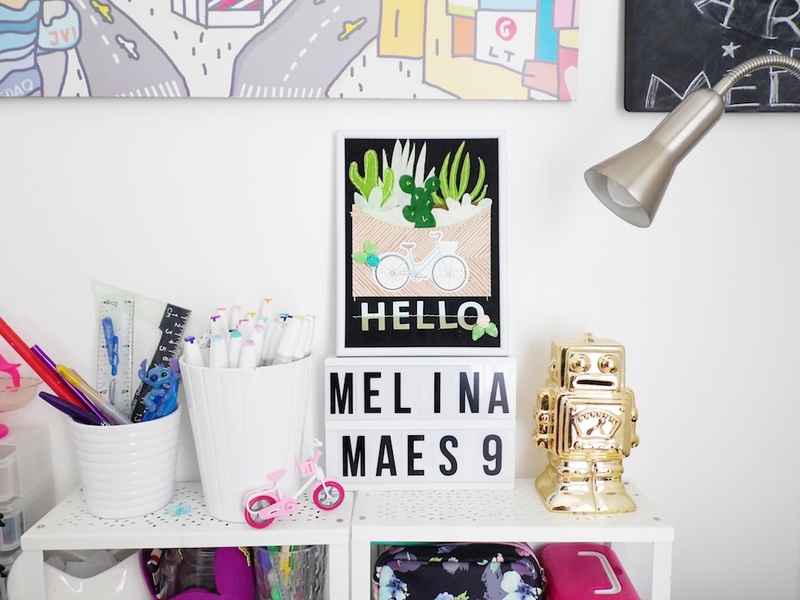 TIP: You could use this same method to create hanging banners as well! 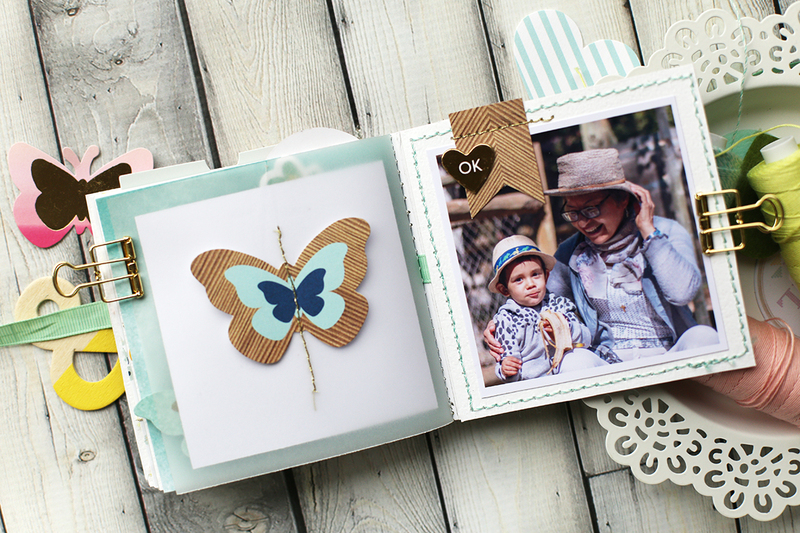 The wood grain print card makes use of the more natural shades in the kit. 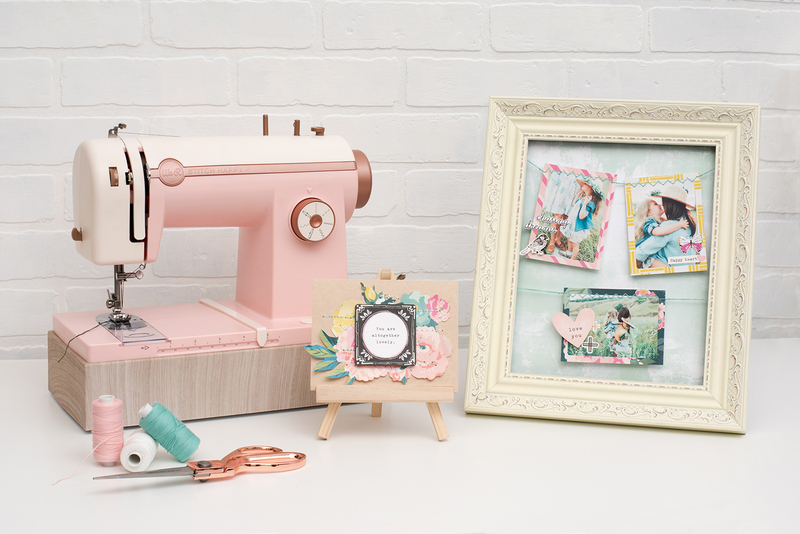 Another great thing about this kit is that it contains both masculine and feminine elements, so you have lots to work with! The letter ‘I’ has been fashioned from an “L” which comes in the kit (originally spelling ‘HELLO’) I have just snipped off the bottom of the letter to create a capital ‘L’. 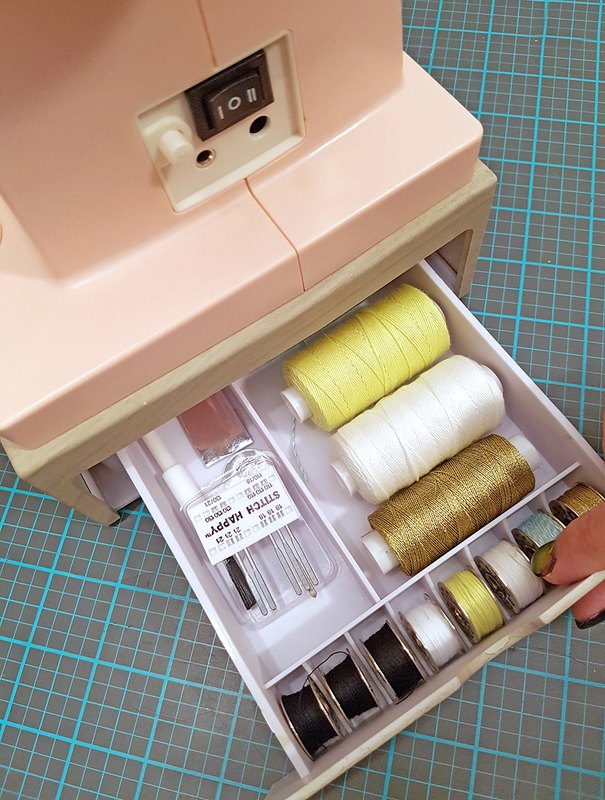 A fantastic feature of the Stitch Happy Sewing Machine is that it has a built in drawer for storage on the right hand side. Very handy for keeping your favourite shades of thread closehand! 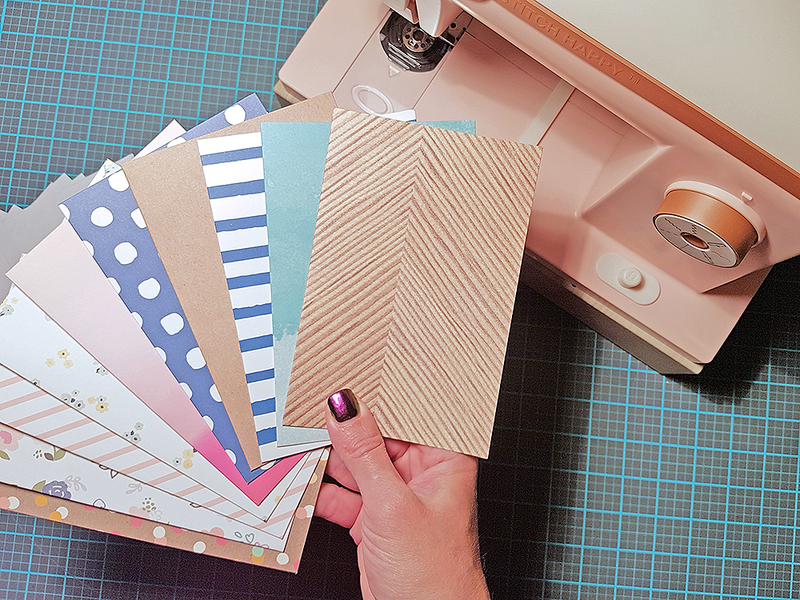 The detail on this card has been enhanced by running lines of stitching, using the woodgrain lines as a guide, at intervals along the front of the card. NOTE: It’s a great idea to hide stitching inside a card by covering it with a piece of paper trimmed to size and adhered over the stitching. This creates a nice neat finish inside. 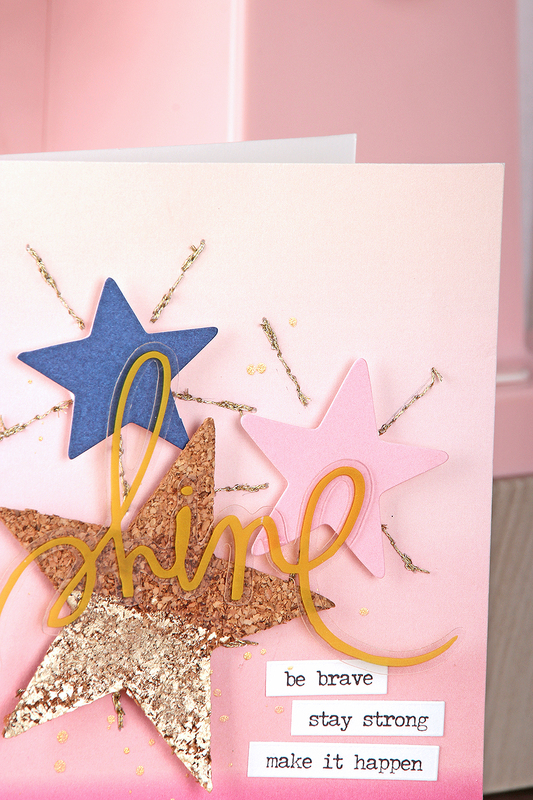 This ‘Shine’ card has a few metallic star bursts with the help of some shimmering Metallic Gold Multimedia Thread. This thread also comes in silver as well! NOTE: Remember to switch out your needle to a number 18 when using this thread weight. 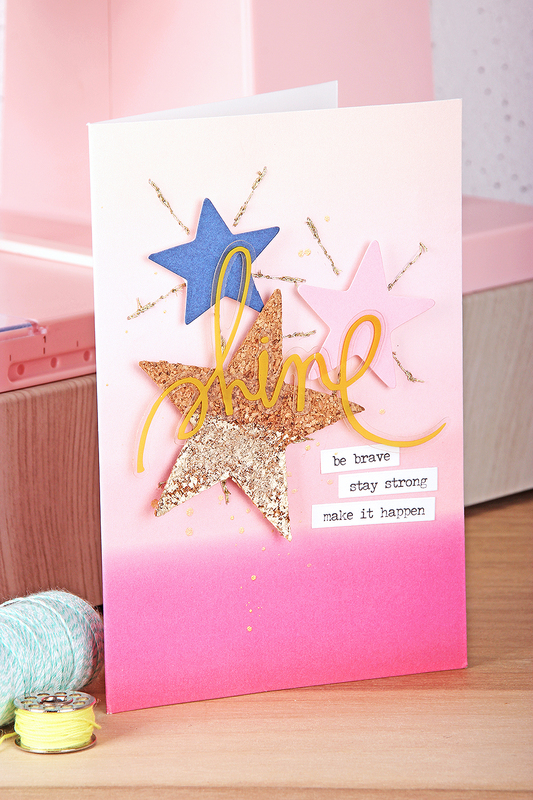 I traced where I wanted the star bursts to be around my die cut star shapes from the card kit and then went about creating the little lines. TIP: It’s a good idea to backstitch when you are doing such short lines to prevent your stitching coming loose. The large cork star is from a Heidi Swapp Minc Starter kit. I used the Minc Reactive Paint to activate the bottom half of the star and then ran it through my Minc Machine with Matte Gold Reactive Foil. I’ve never tried foiling cork before, so it may be slightly wonky, lol, but I do love the slightly distressed look the cork provides. 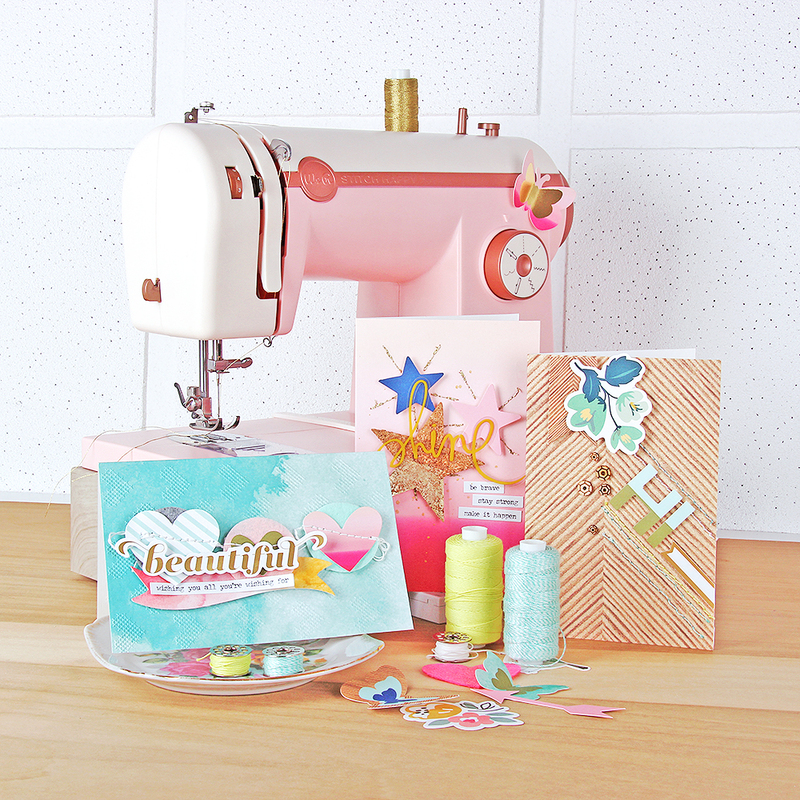 I have absolutely no doubt you are going to be amazed by this clever sewing machine. Fabric… paper…. The opportunities to create are limitless! Hi everybody! 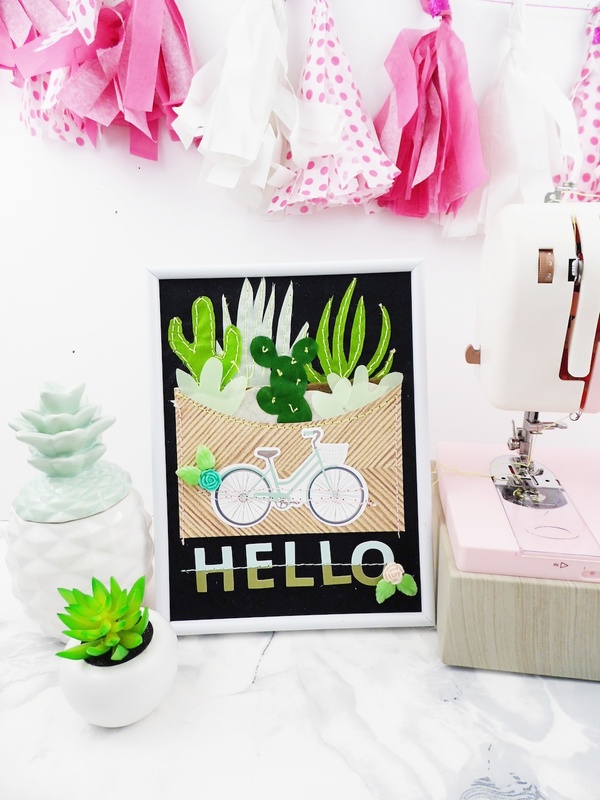 Soraya here with you today to show you a cute and fun tutorial using the incredible Stitch Happy sewing machine. And I can tell you that the simple fact of using it will surely make you happy! 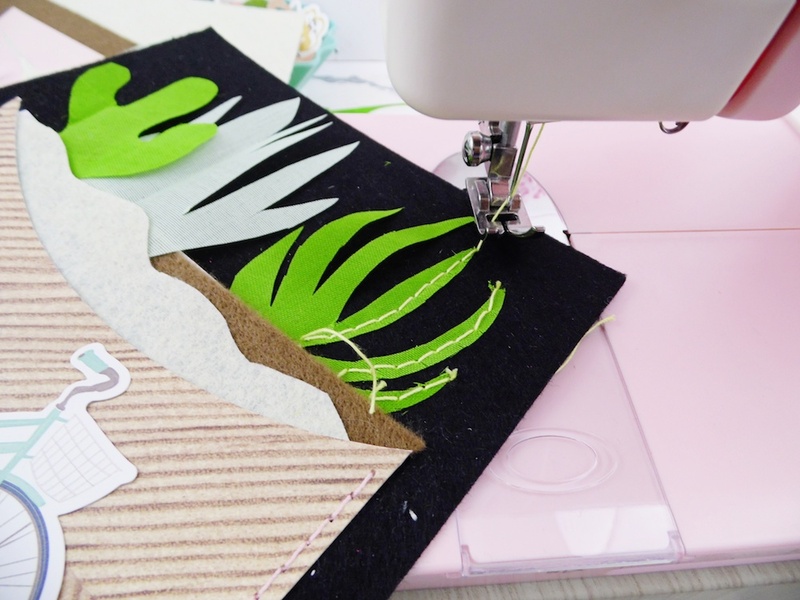 So to show you how amazing is this multimedia sewing machine, I made a cactus frame decor for my daughter’s bedroom using felt, fabrics, papers and some colorful threads and twines. First of all, I used my Supreme Ruler to cut the black felt in the right dimensions so it can fit the background of the frame (I removed the glass for this project). 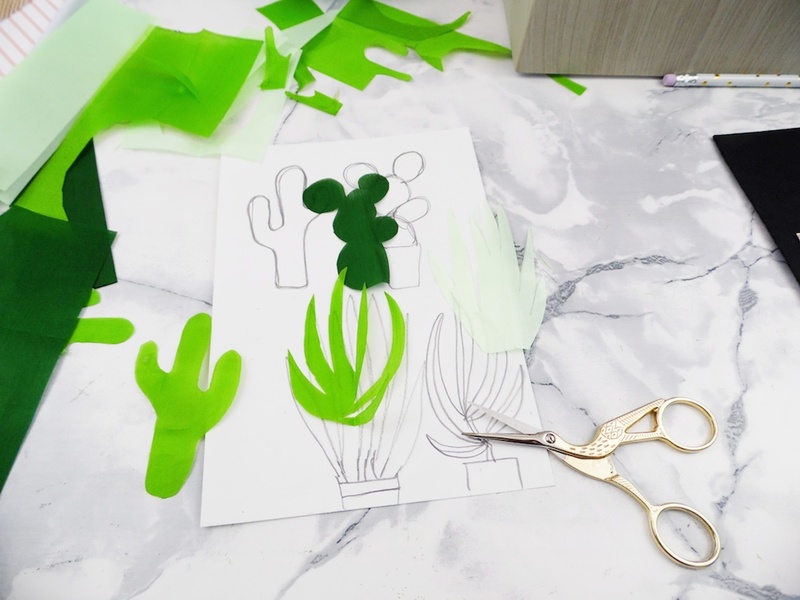 Then I used one of the cards from the Stitch Happy Card Kit and the DIY Party Board to create the pocket where all the different cactus will “grow”. 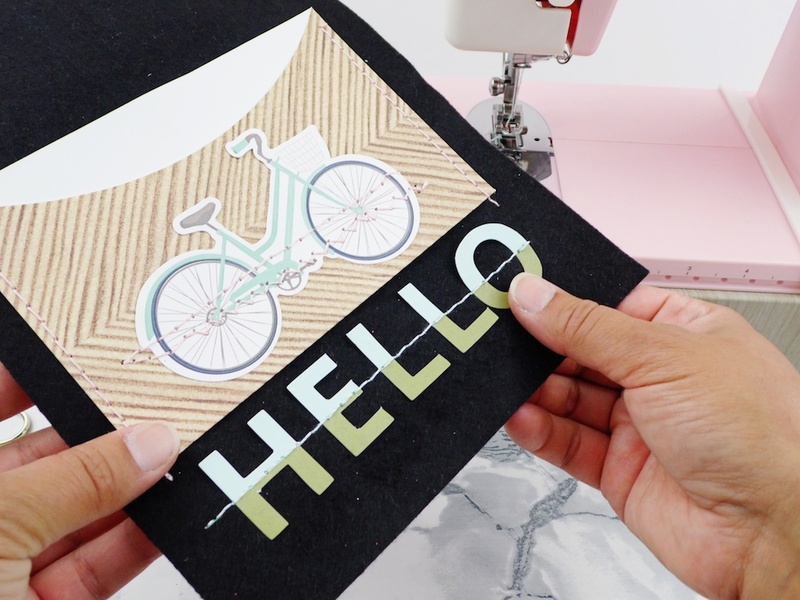 In this card kit, there are also lots of happy diecuts to decorate so I grabbed the bike and stitched it to the pocket with some pink thread. The result is awesome! After that I sewed the pocket directly on the black felt which is now the background of the frame decor. 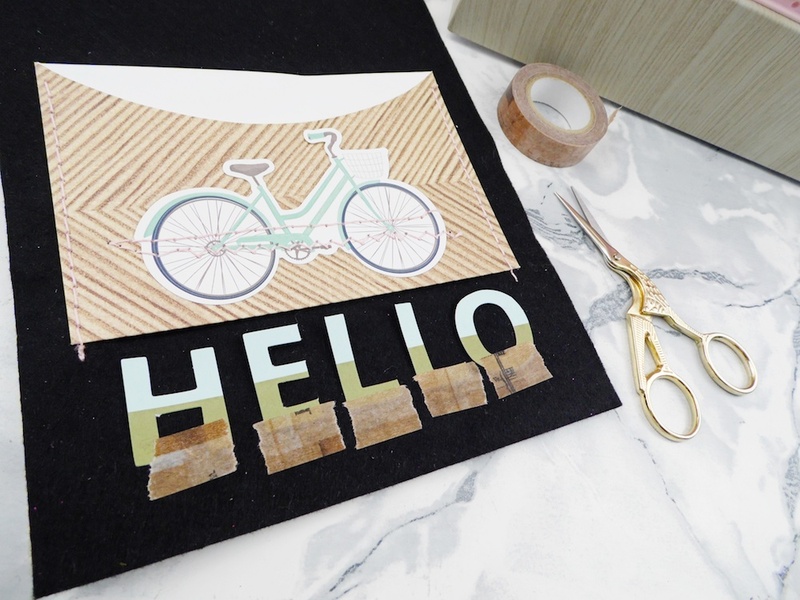 To set the title “HELLO” I put some washi tape on the letters so that they can stay in place. I removed the washi tape just after the sewing process. Let’s draw the cactus! I used different shades of green fabrics to make them. They are so delicate and cute, I love how they turned! Then I started to sew them all with some yellow thread! For the big cactus on the front, I used the “back” button of the sewing machine to create the needles and it worked very well! To finish this frame decor I put back the background in the white frame and glued some resin flowers and leaves on it! 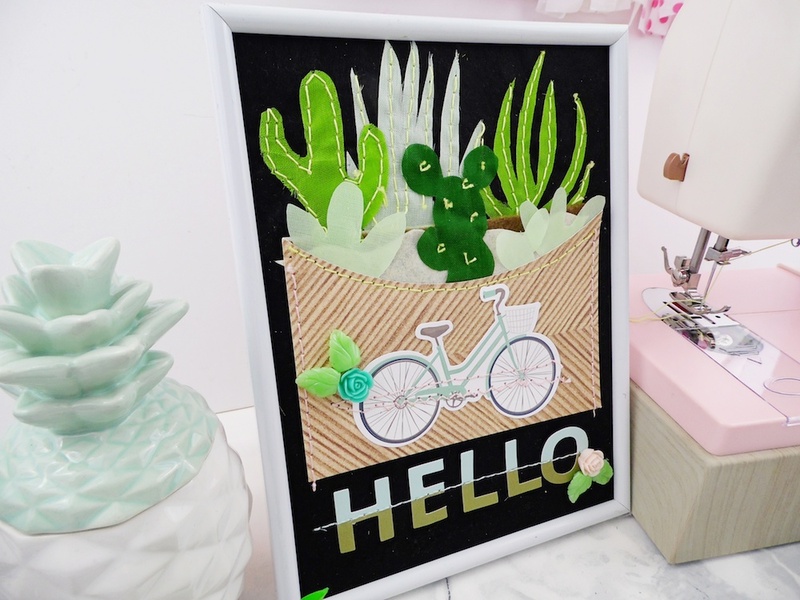 Hope this project will inspire you to create with the Stitch Happy sewing machine, I had a lot of fun making this frame and my daughter is more than happy to decorate her room with it! Hello everyone! 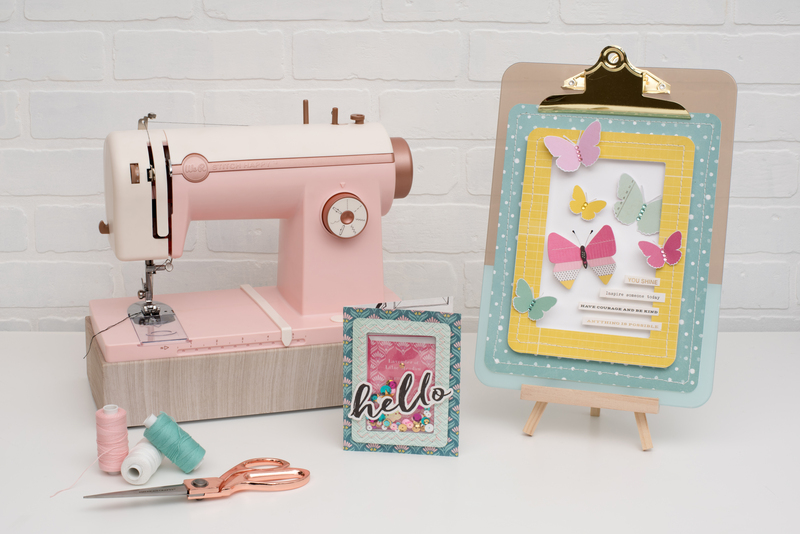 It’s Eva here showing you how to use your Stitch Happy sewing machine and Stitch Happy Card Kit to make a lovely mini album. When I saw the Stitch Happy Card Kit I knew it would be perfect for a mini album. 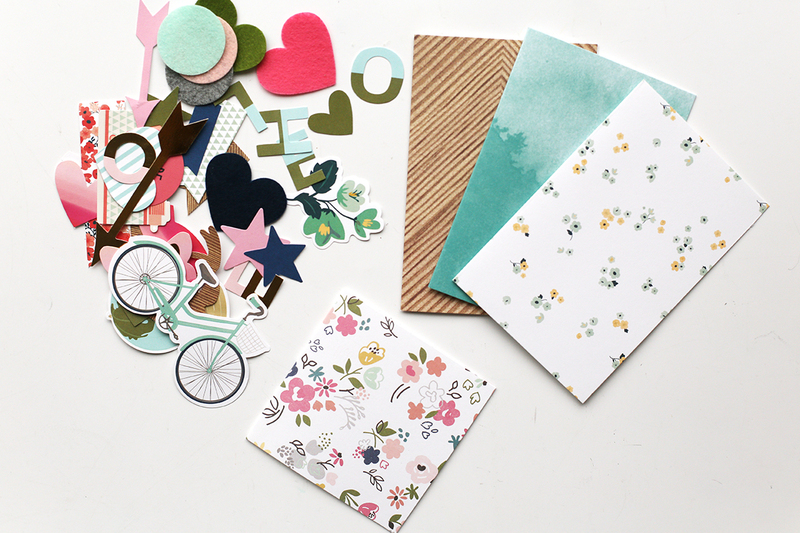 In the kit you get different card designs, die cuts and even felt! All perfectly coordinated to make your job really easy. I started by trimming some of my cards to 4 inch height. I used 3 cards for my mini album, one for the cover and two for the inside pages. Because I didn’t want my stitches to show on the back side of the card I created some 4×4 inch white squares and decorated them with some twine and thread from the Stitch Happy collection. I used mint baker’s twine, pink, citrine and gold. I really like the thickness of the threads, your stitches stand out from the page and the scallop decorative stitch is absolutely lovely! To assemble the mini album I cut my cover in half and added a floral paper in the center using the zig zag stitch and the gold thread (this way the cover was a bit wider) Next, I stitched each page slightly off the center of the cover. The mini album was a bit thick but the Stitch Happy Machine had absolutely no problem! No more broken needles or thread! 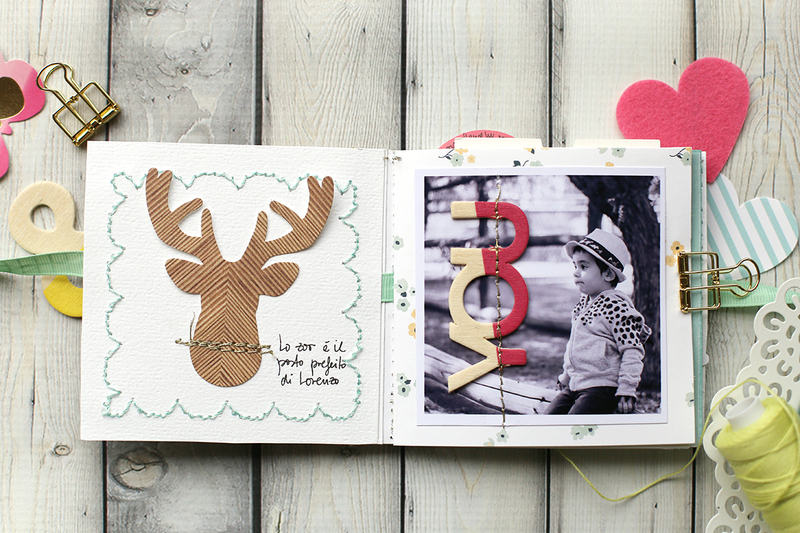 I had fun decorating all the pages of my mini album, the golden thread added a nice touch. To decorate I used the die cuts that came with the Card Kit and some wood veneers and die cuts from the Take Me Away Collection by Pink Paislee. 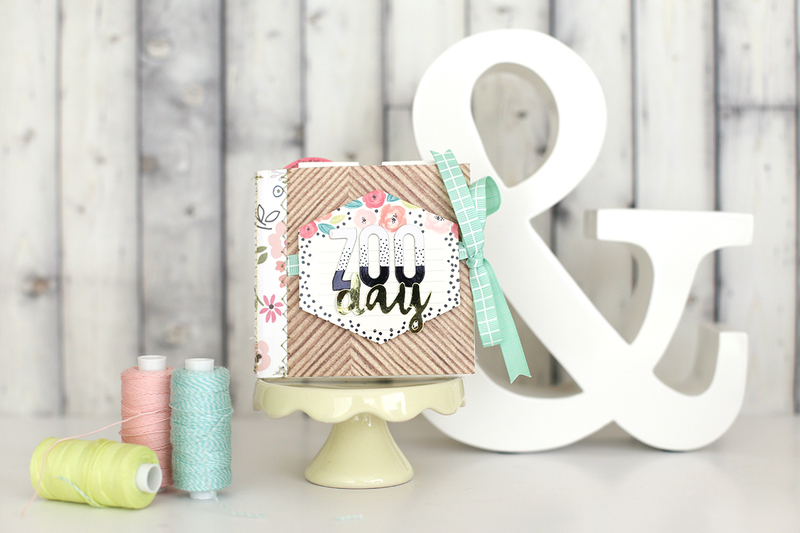 I used the decorative stitches to create different backgrounds like the scallop page you see below. 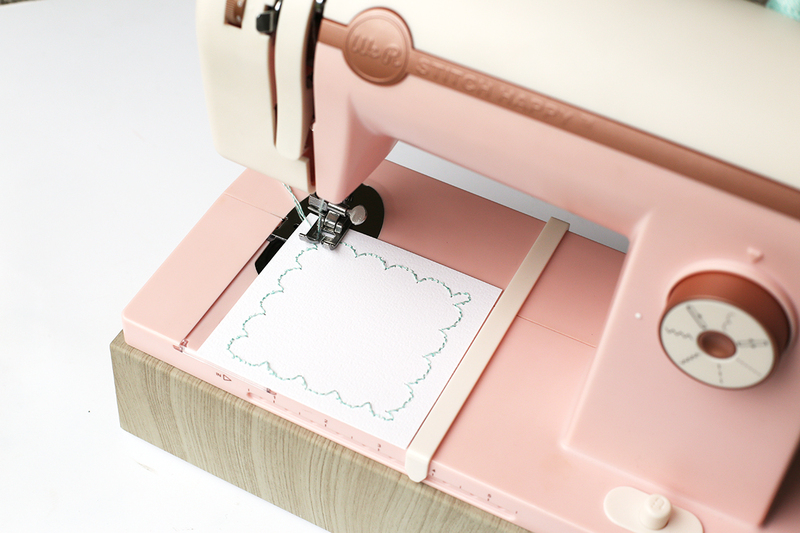 With the Stitch Happy Machine you can easily add felt, fabric and even leather to your projects! 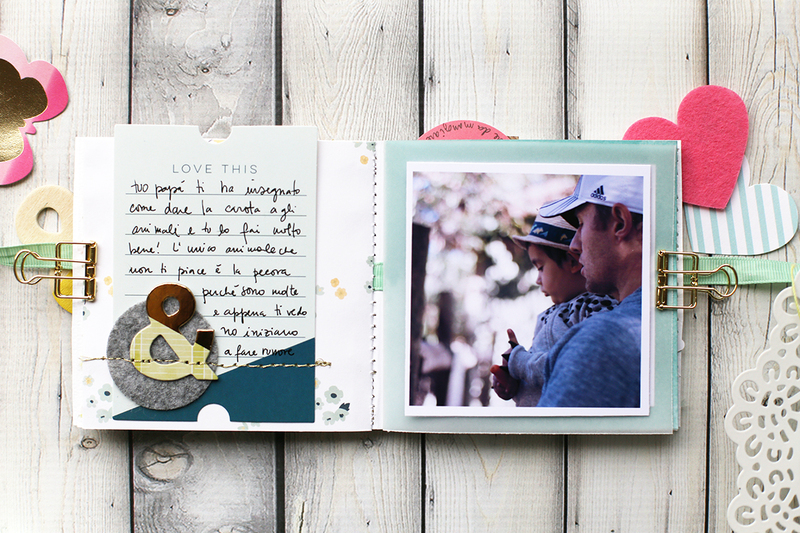 Here are some of the other pages of my mini album. 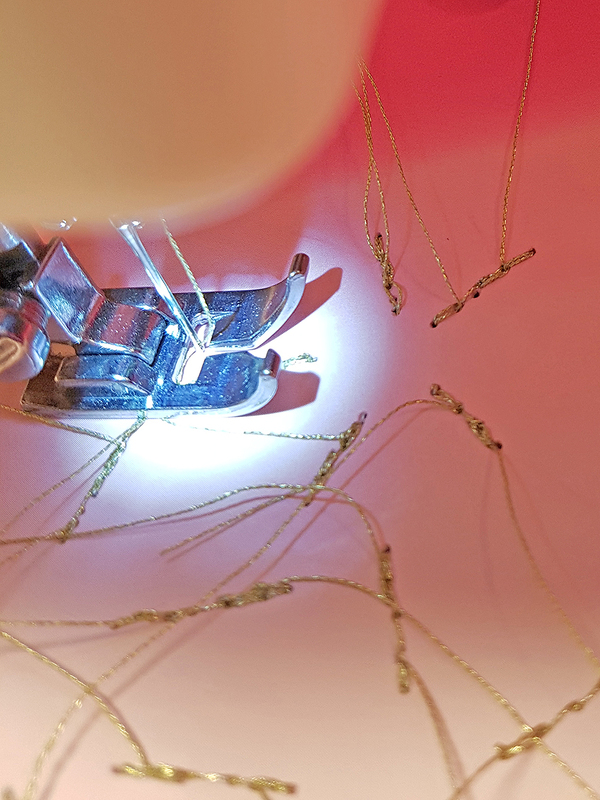 Tip: Remember to change needle when using the gold thread otherwise the thread might break. Thank you so much for joining me today! Do you have a Stitch Happy Machine? What are you waiting for? I am sure you are going to love it as much as I do! Hello We R friends, and welcome to Stitch Happy Week! Our design team has been playing around with their machines, and they’ve put together some awesome projects that you’re going to love. Today, we’re featuring some project inspiration from our fabulous in house designers, so sit back, relax, and enjoy the eye candy! 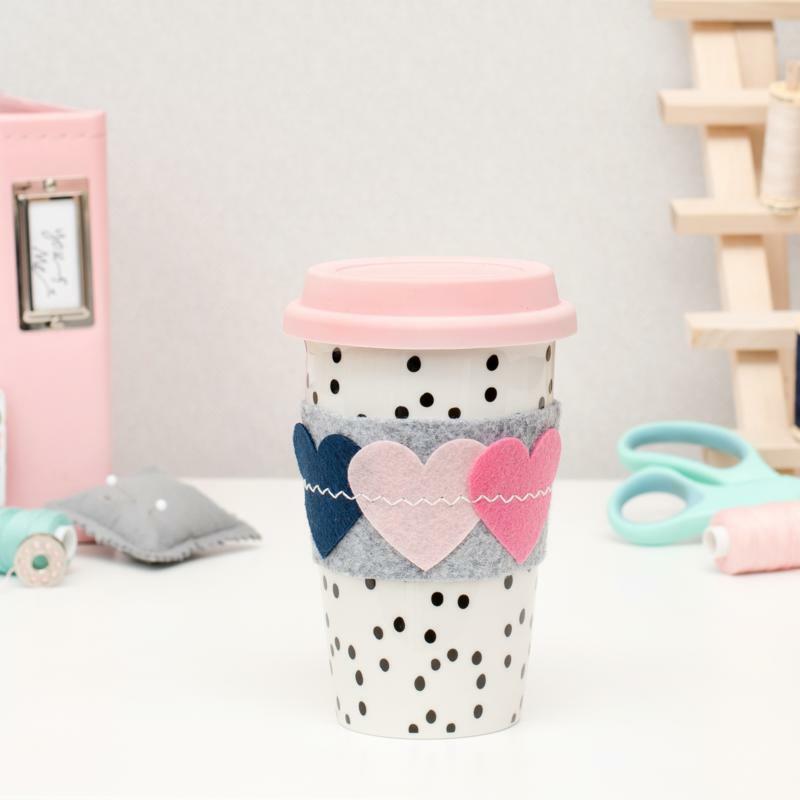 Keep your favorite hot drink from getting cold with this cute felt coffee cozy. It’s easy to add distinct decorative stitching with the Stitch Happy. 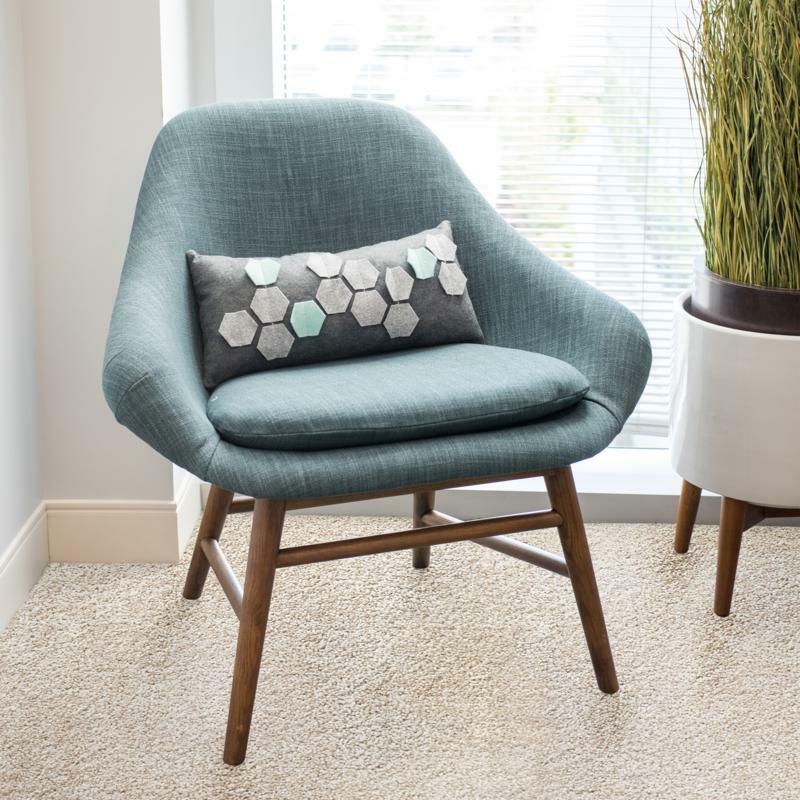 The Stitch Happy has an enhanced motor so it can handle multiple layers of thick material, such as upholstery fabric, faux leather, light denim, and more! 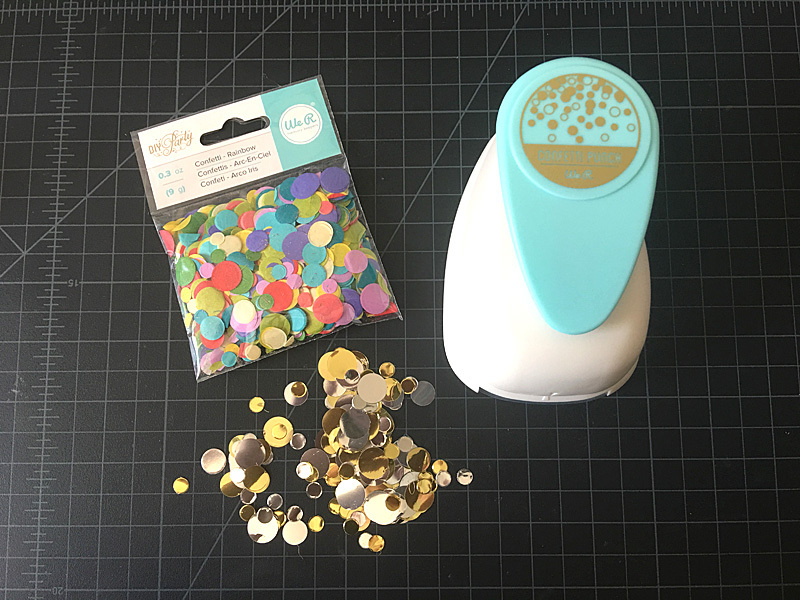 The Stitch Happy can do everything a basic sewing machine can, so it can take care of all your favorite fabric sewing projects with regular thread as well, including making button holes. 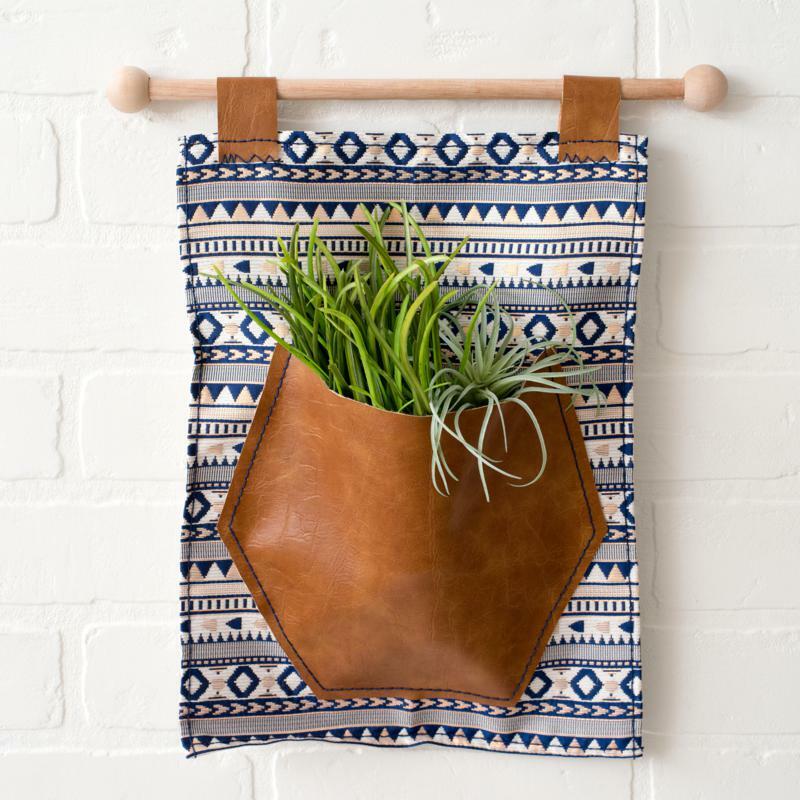 No need to swap needles when working with paper and fabric! 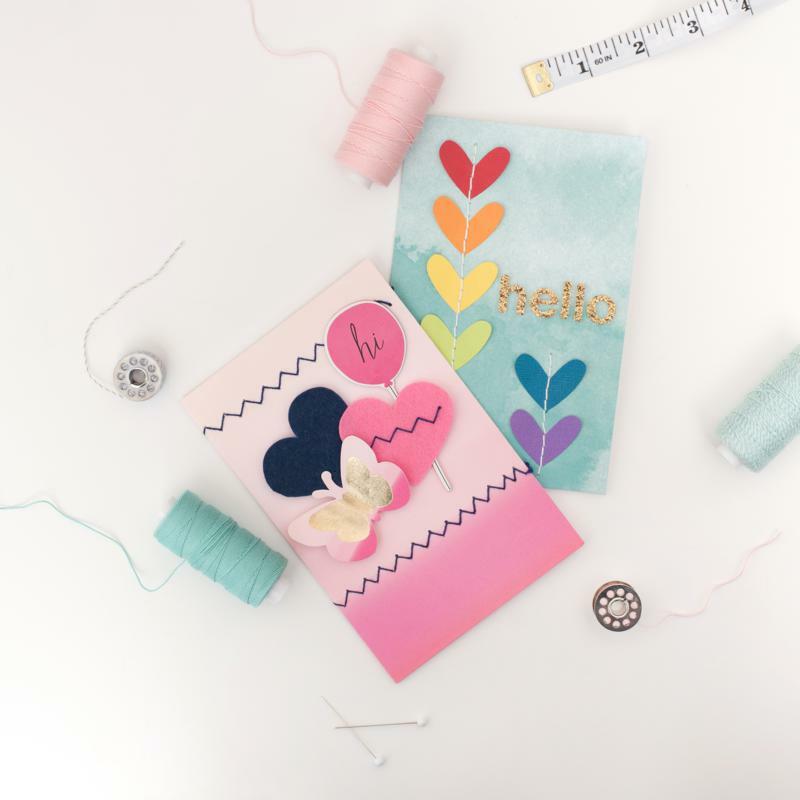 The Stitch Happy multimedia needles are specially coated so they won’t dull when used with paper. 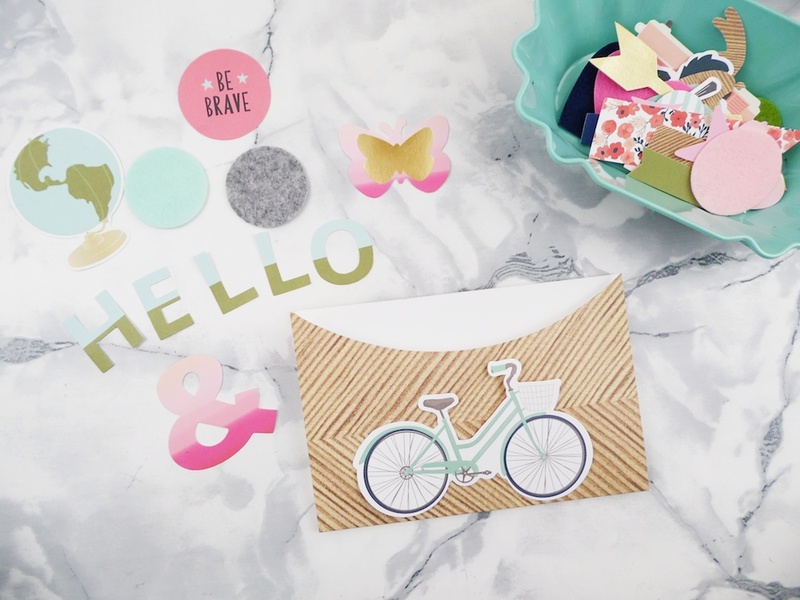 Add beautiful detail and texture to your paper craft projects. 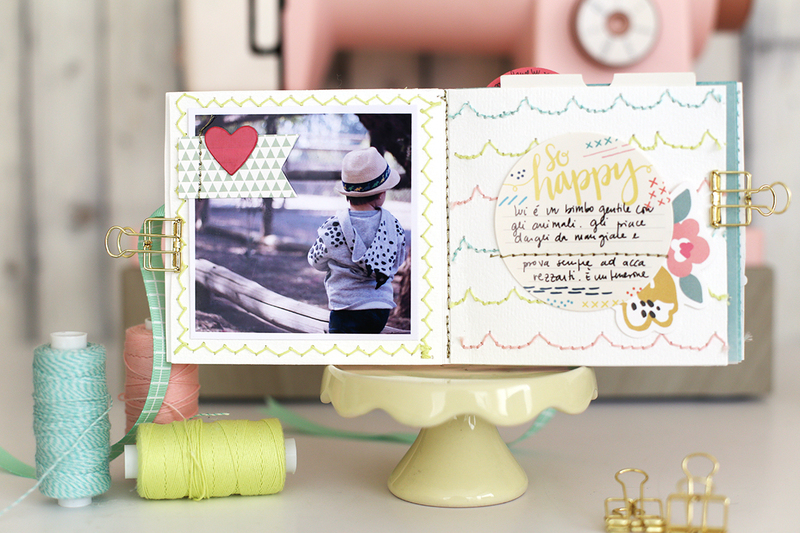 We hope you enjoyed these Stitch Happy project ideas. 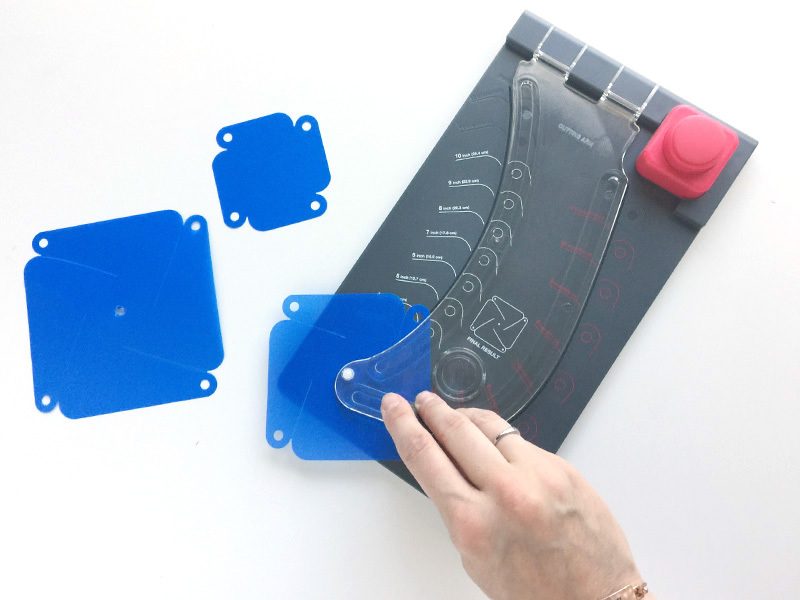 Be sure to check back each day this week for some more sewing projects and tutorials featuring this fabulous new tool!